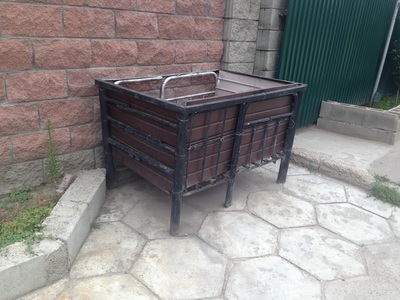 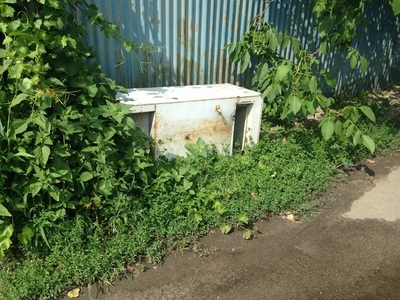 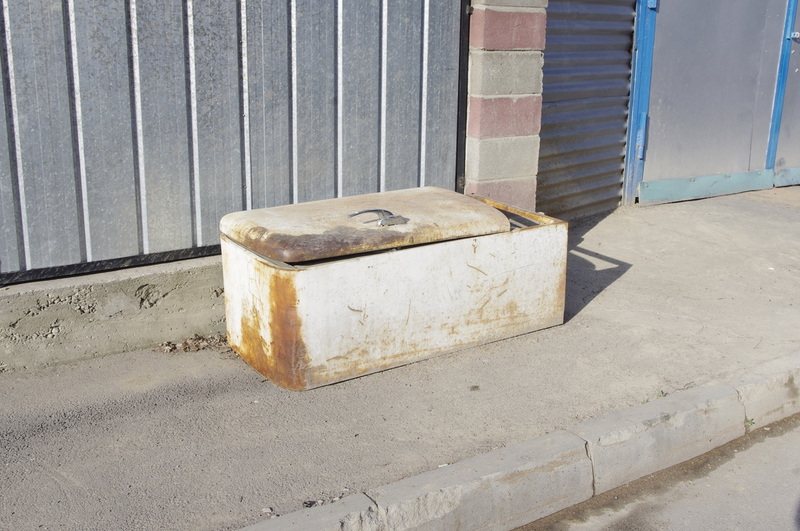 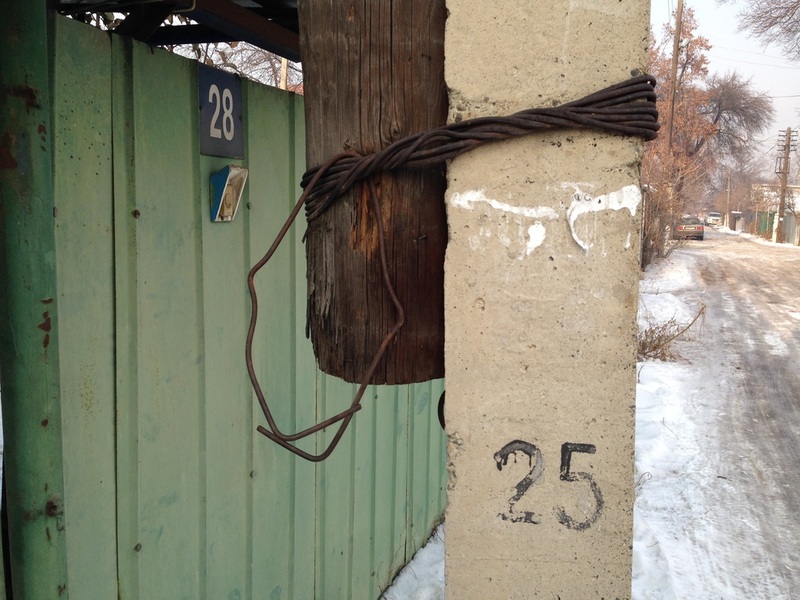 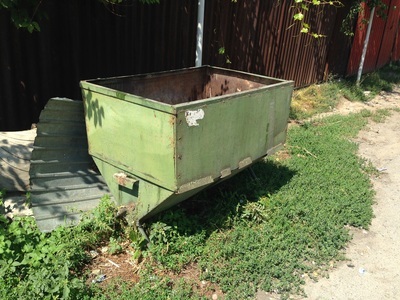 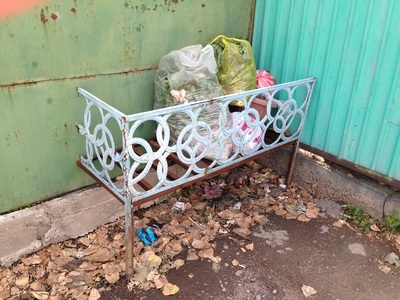 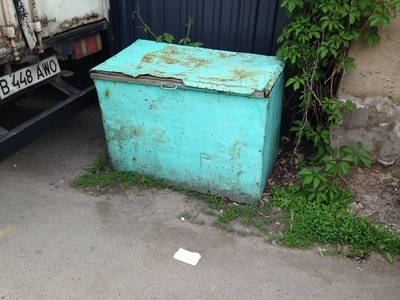 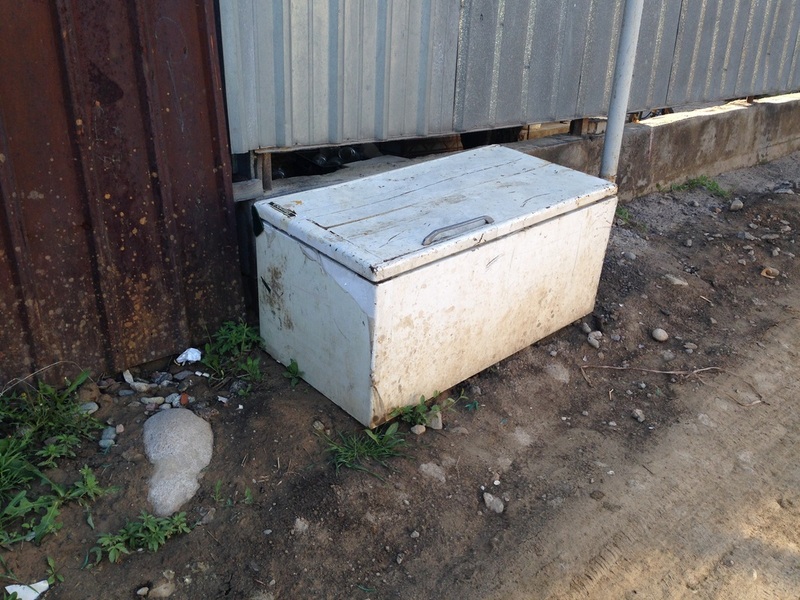 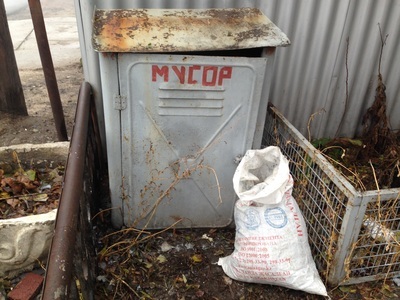 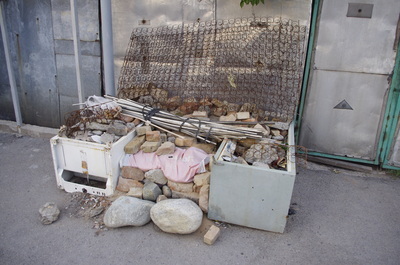 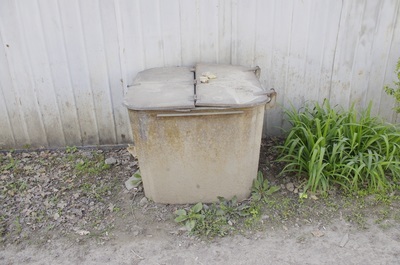 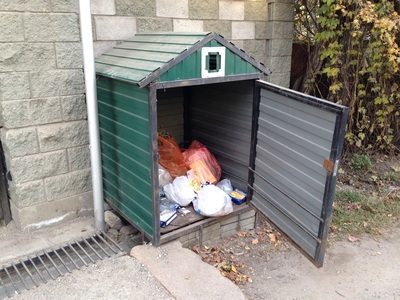 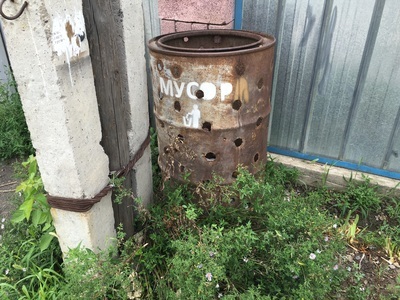 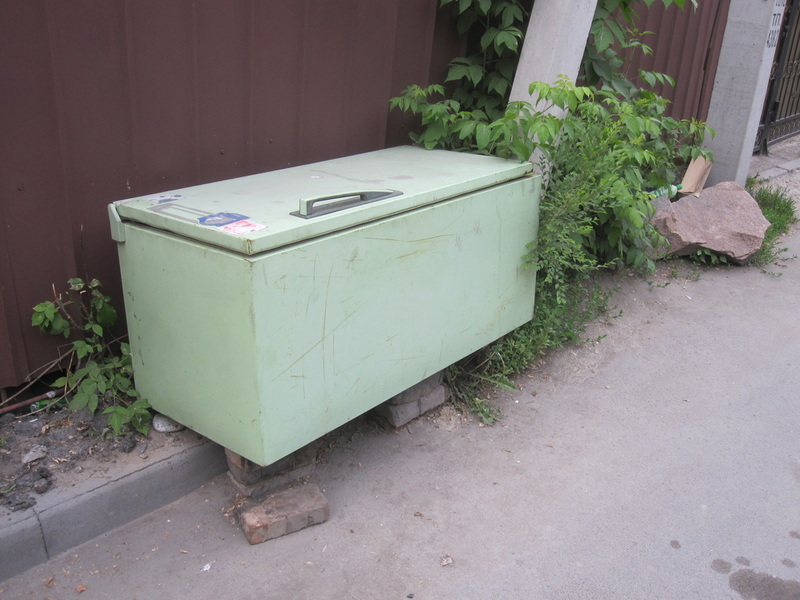 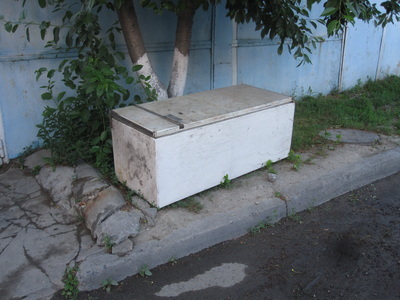 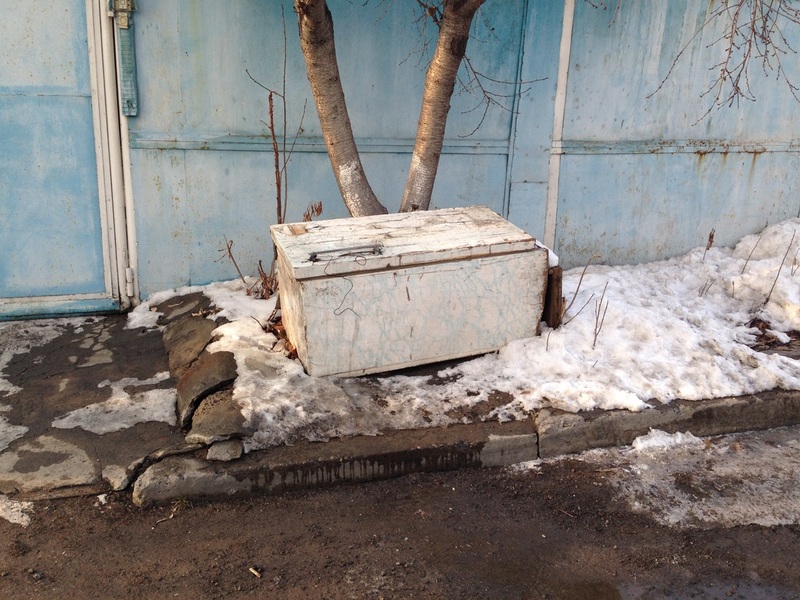 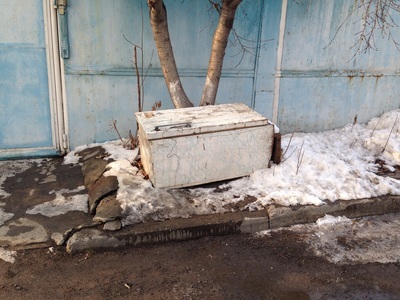 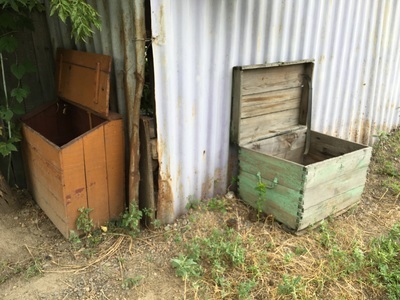 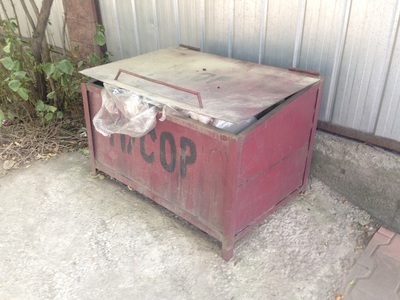 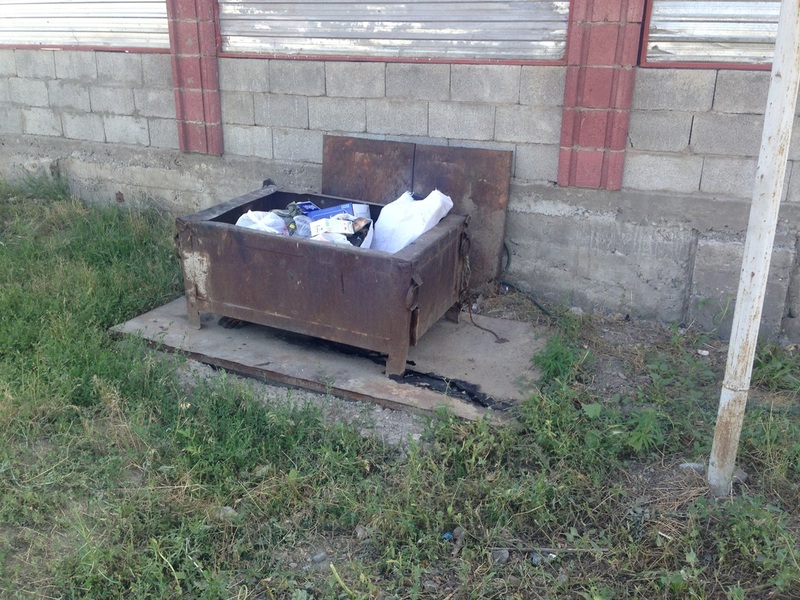 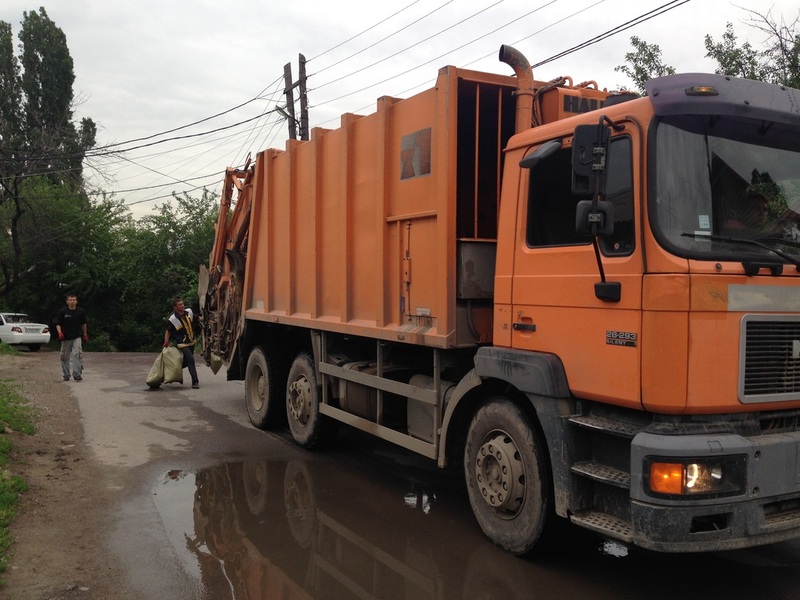 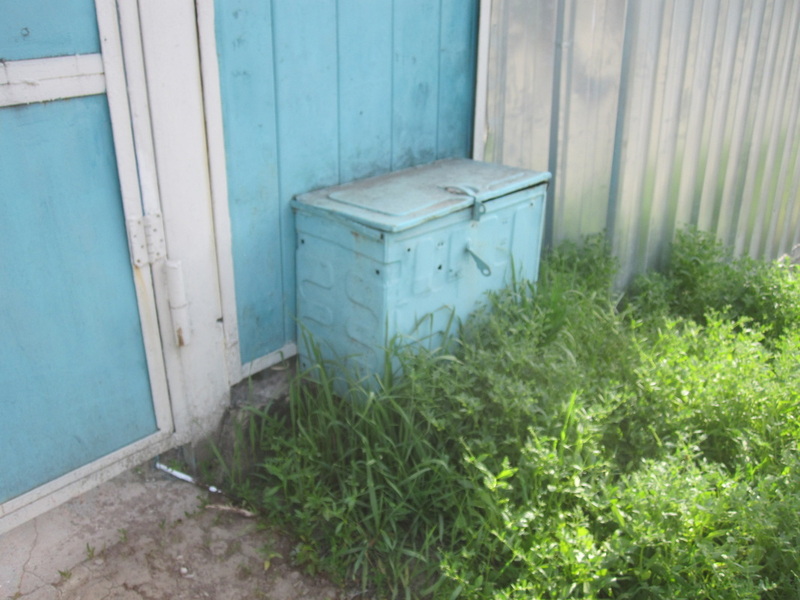 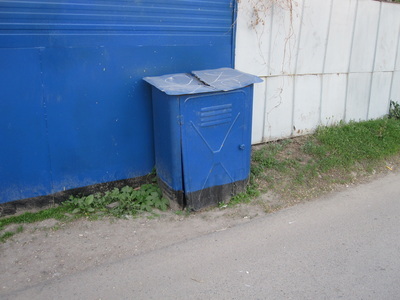 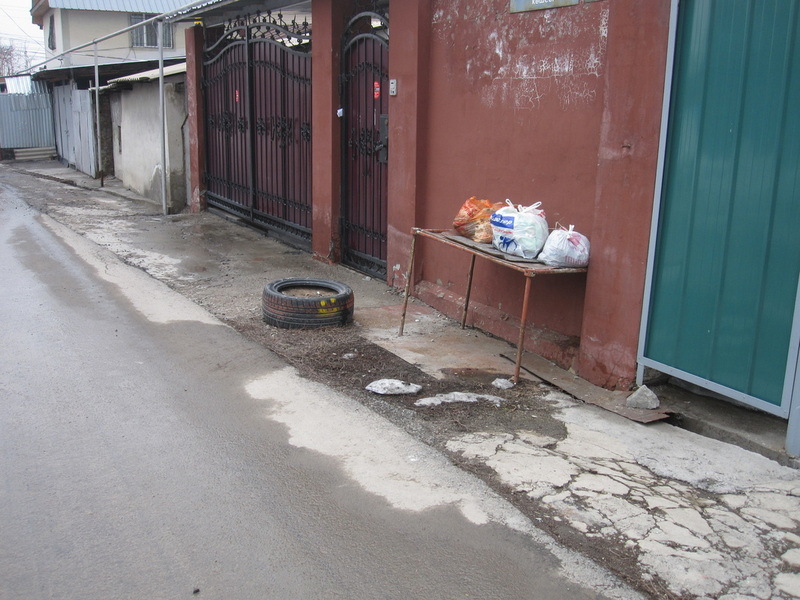 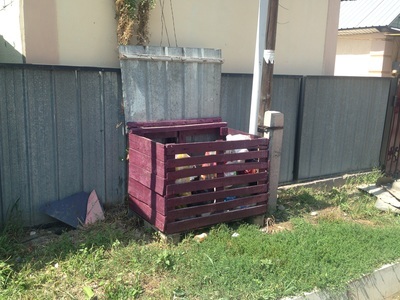 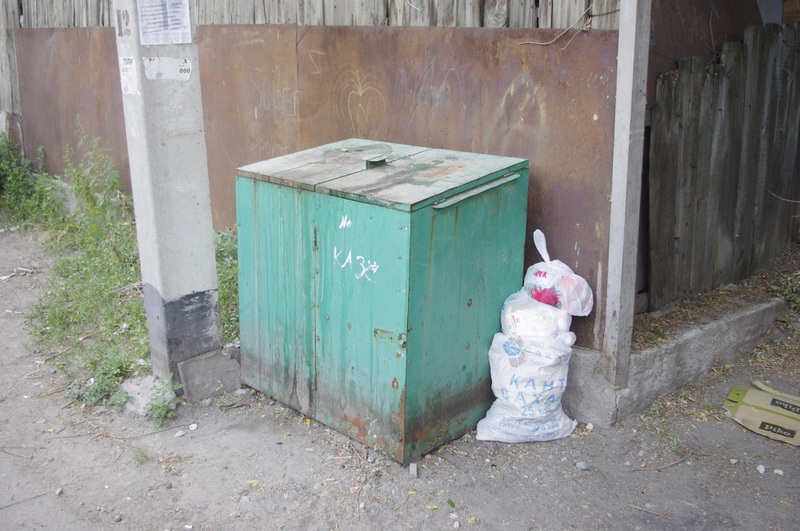 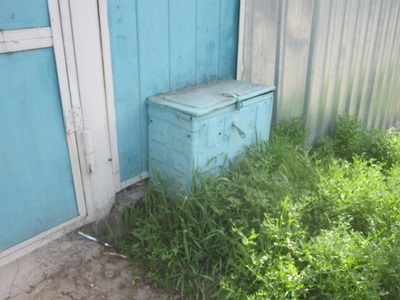 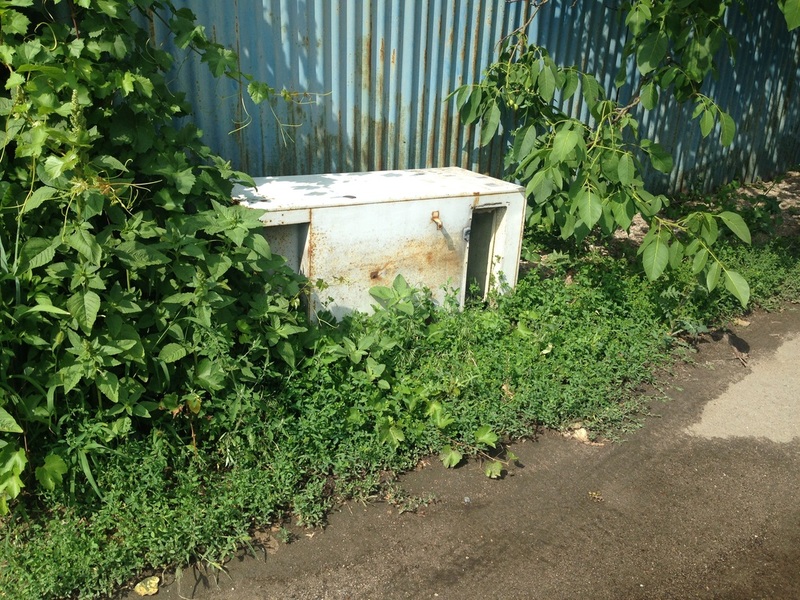 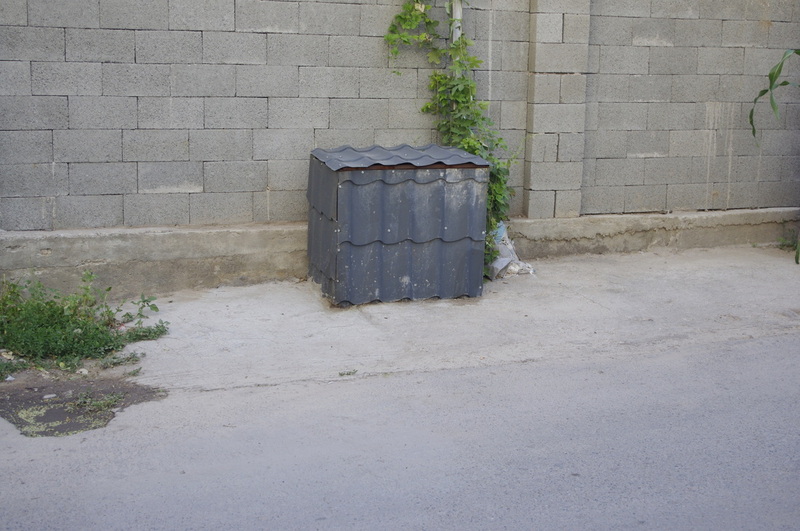 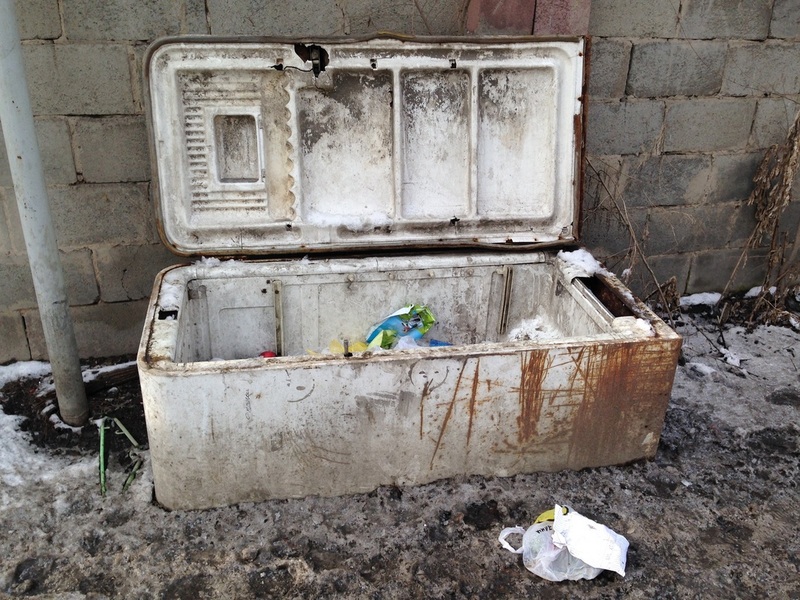 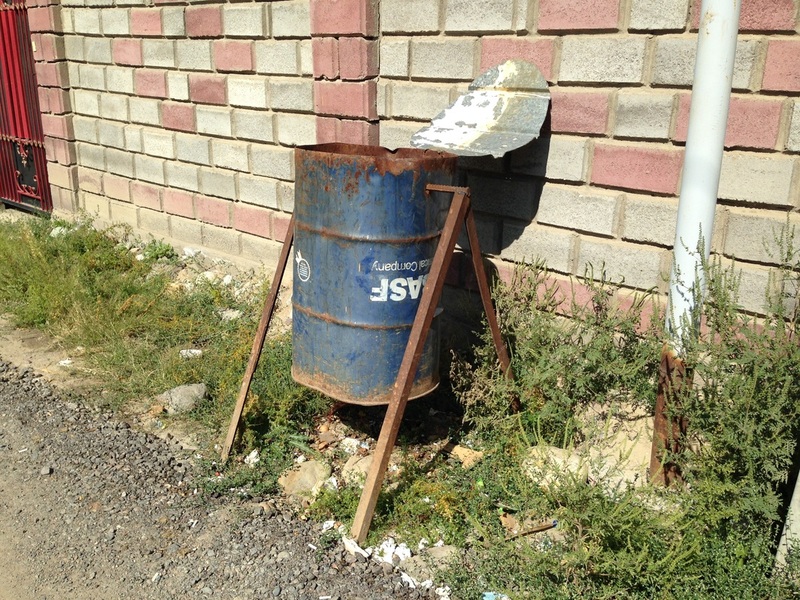 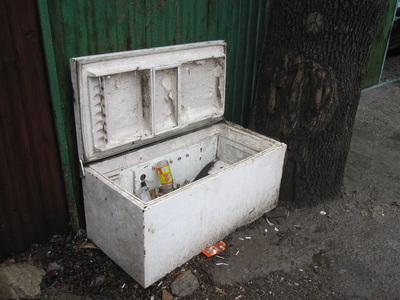 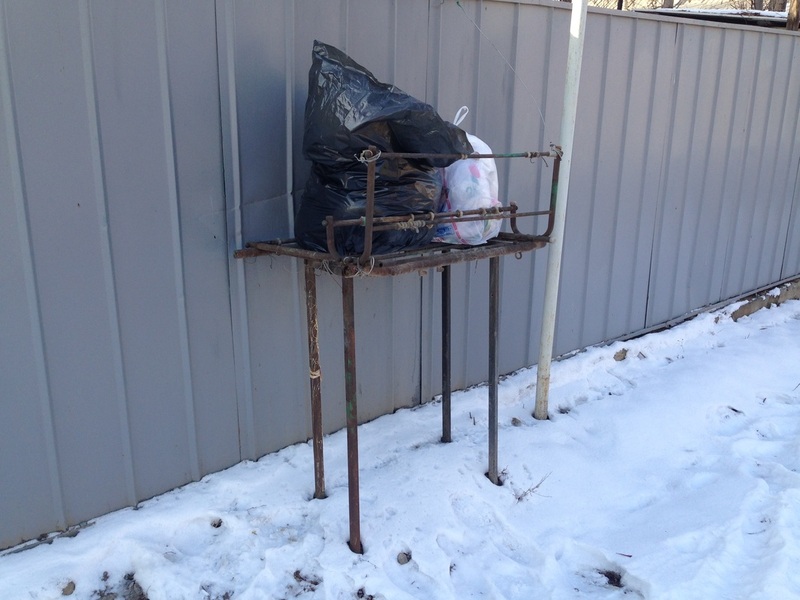 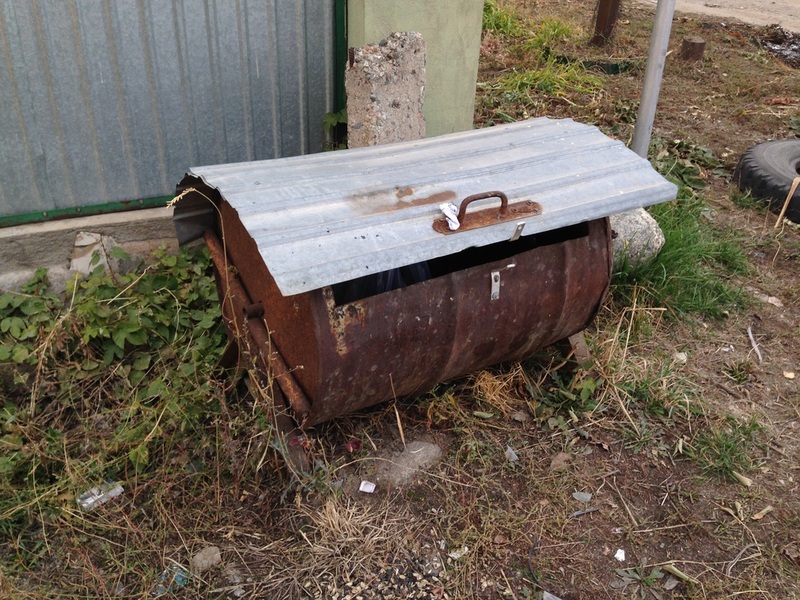 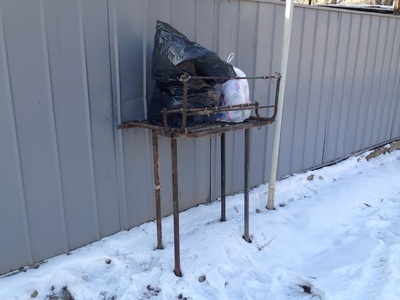 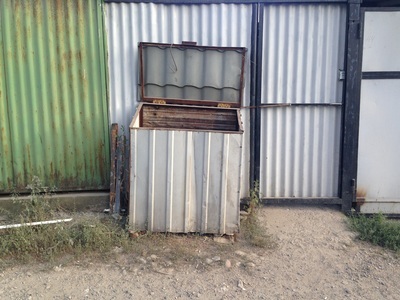 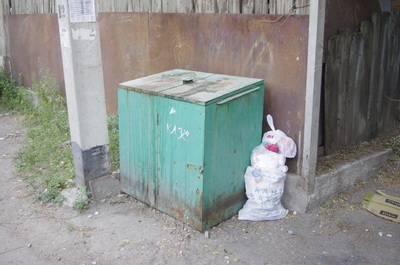 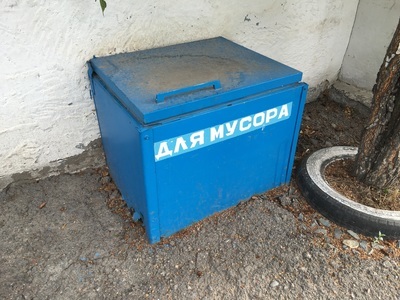 Apartment blocks in the center of Almaty have devoted dumpsters for waste removal, but private homeowners in the cottage districts have no standardized trash receptacles, and I'm not even sure how the garbage there gets removed; I've walked for days in these places and have never seen a trash truck. Lacking a municipally-mandated waste bin, people have been forced to get creative with where they take their milk cartons and potato shavings on trash day, and though it's not a glamorous subject, it's these sources of ingenuity, like addresses and doorbells, that make these neighborhoods such a reward for the detail-oriented walker. 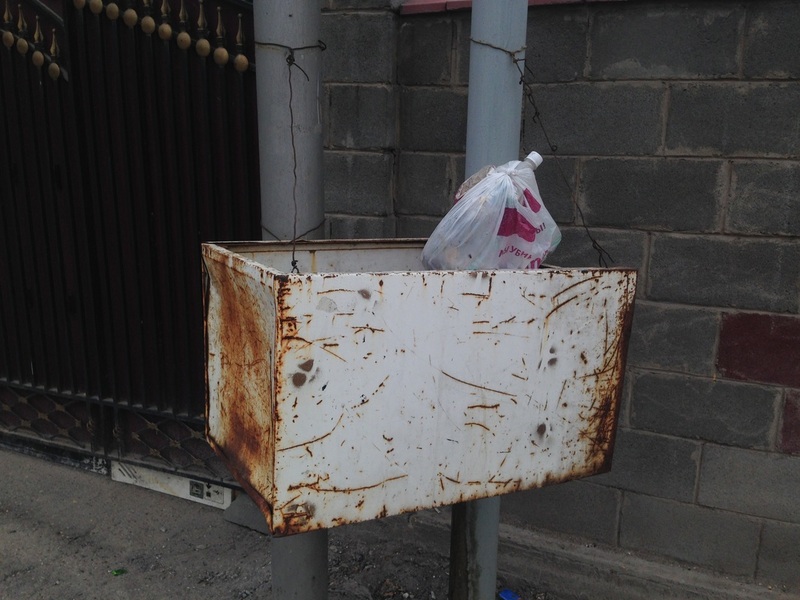 Once upon a time, it seems there were some people at city hall who had the resources to mandate an official trash solution. 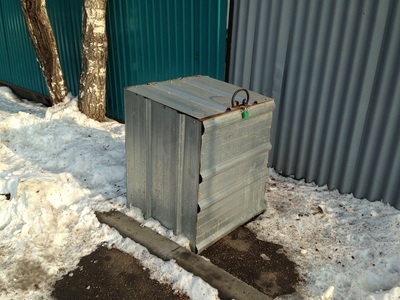 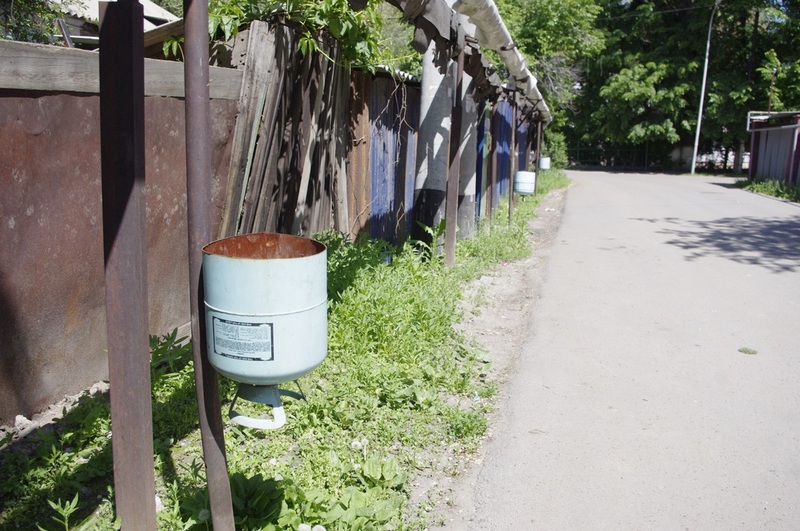 In the neighborhood of Pervaya Alma-Ata, the streets are lined with metal boxes, identical in form, a geometric design on the front and four slits for ventilation of fumes. 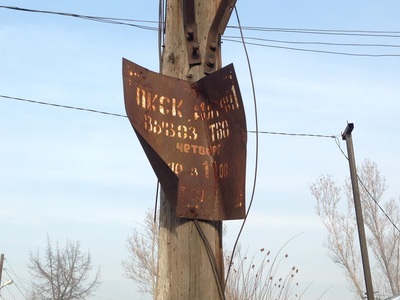 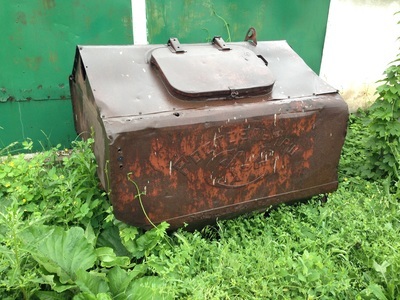 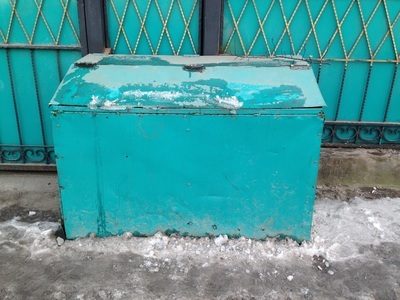 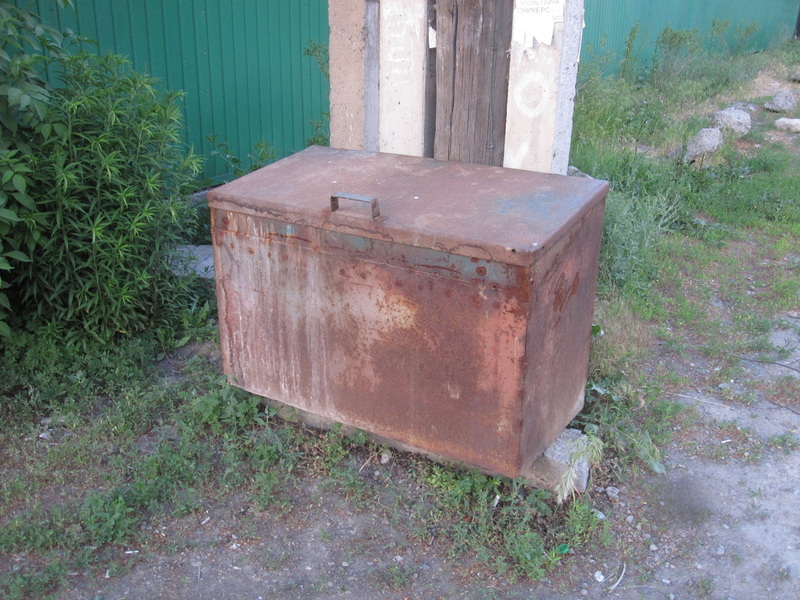 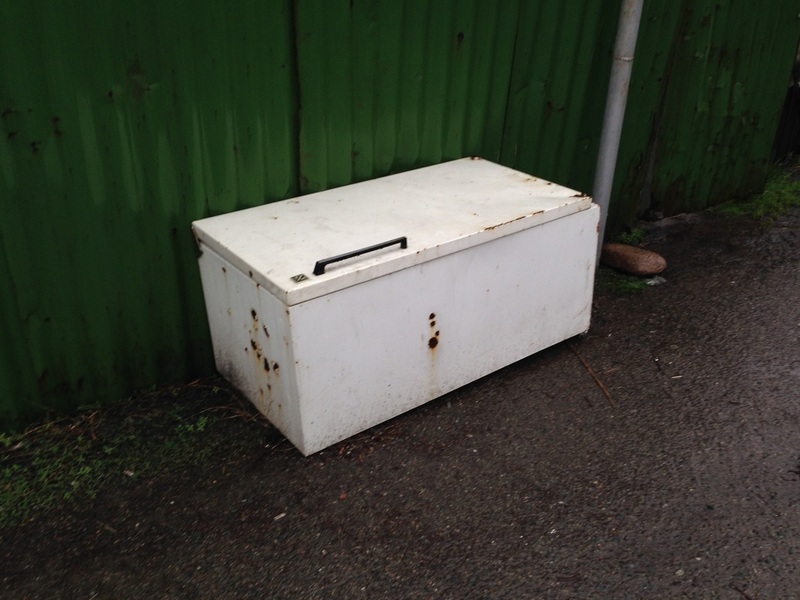 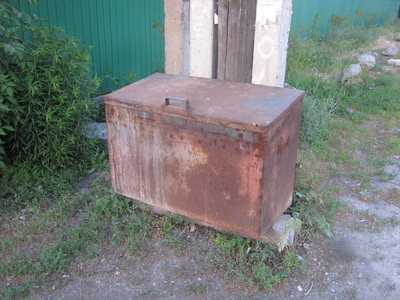 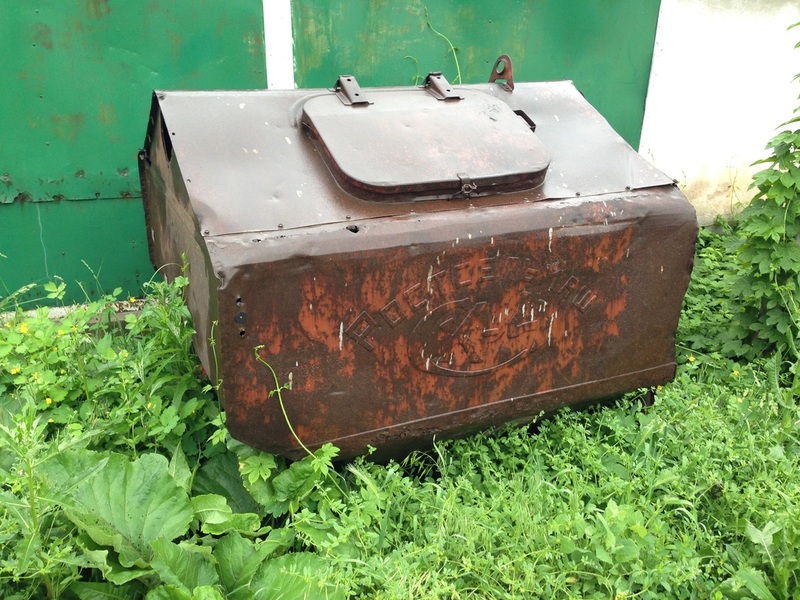 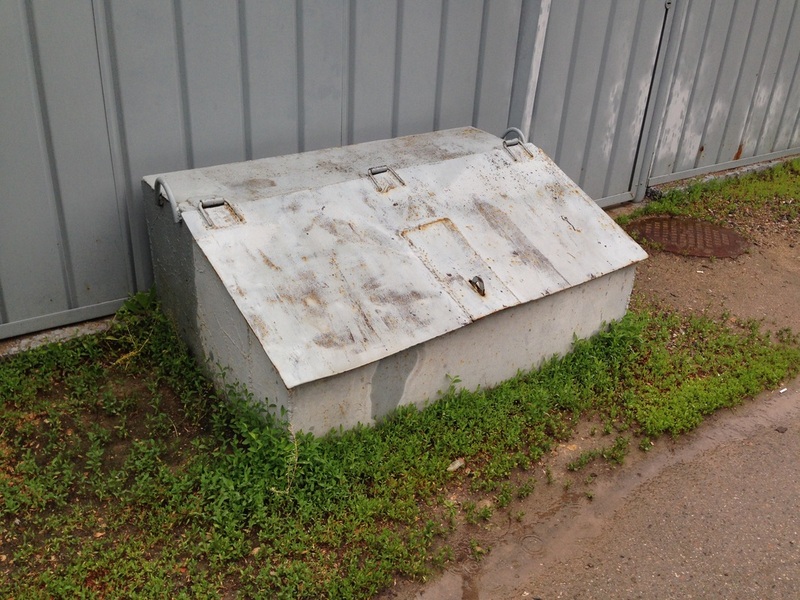 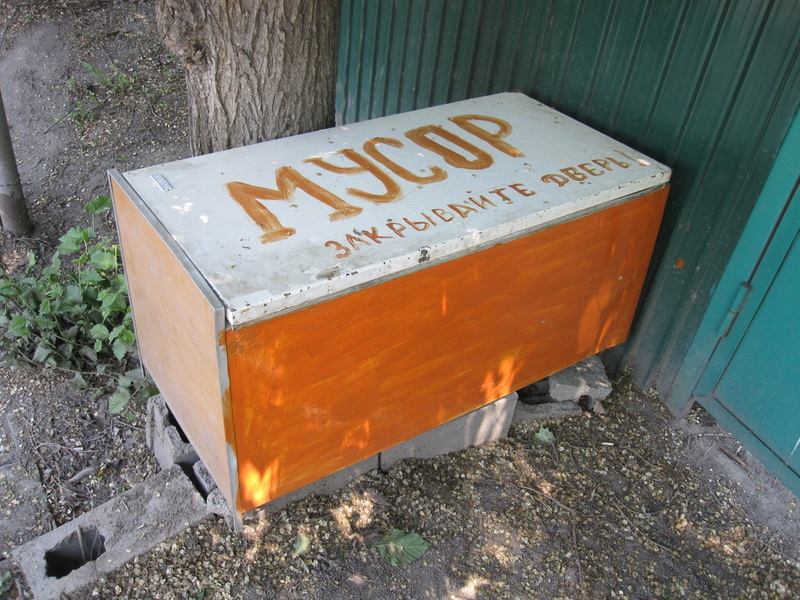 One of these, I found, even had a label, "Trash Box" [Мусорный ящик; Musorny yaschik], as if we needed to be assured of what it was. 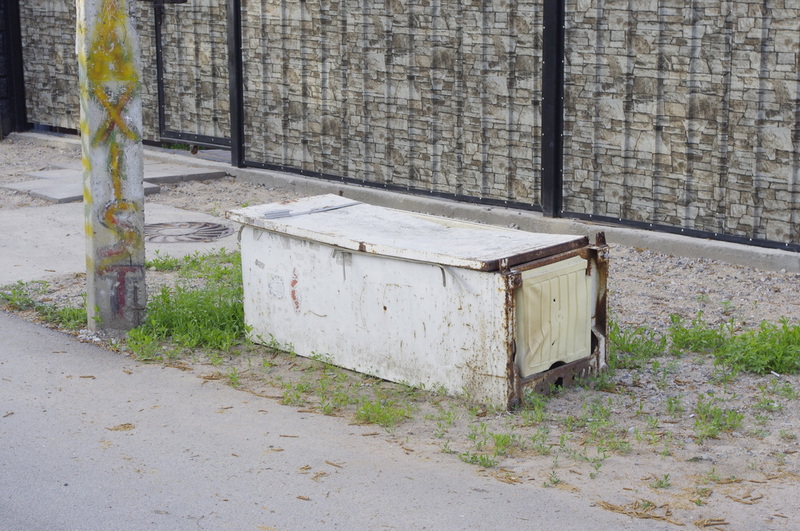 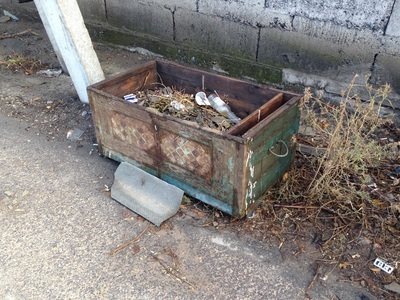 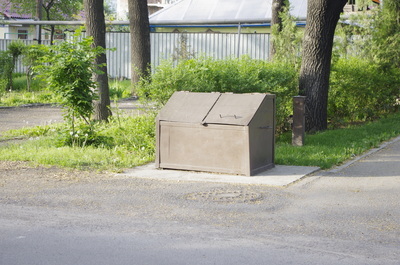 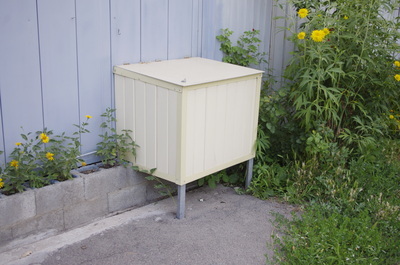 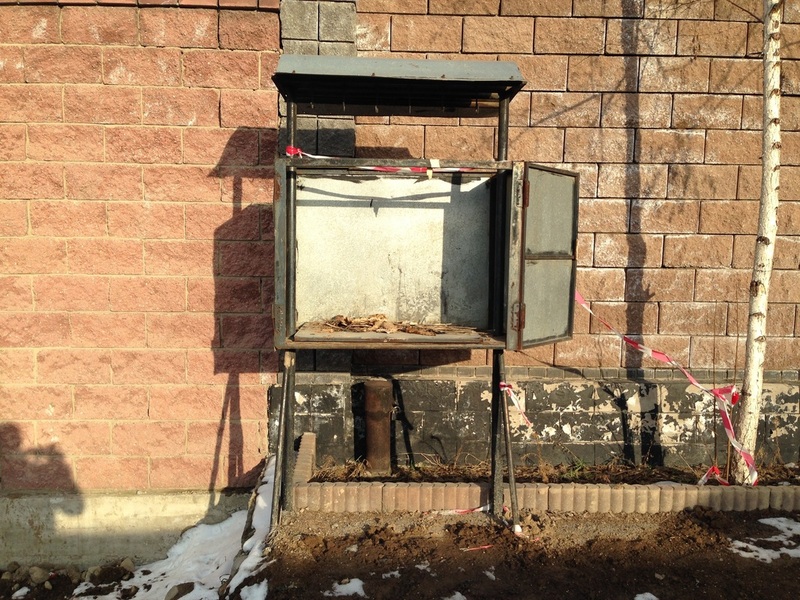 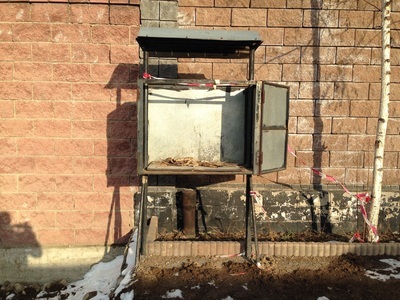 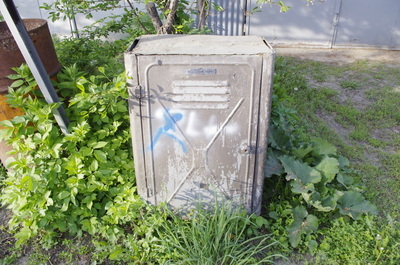 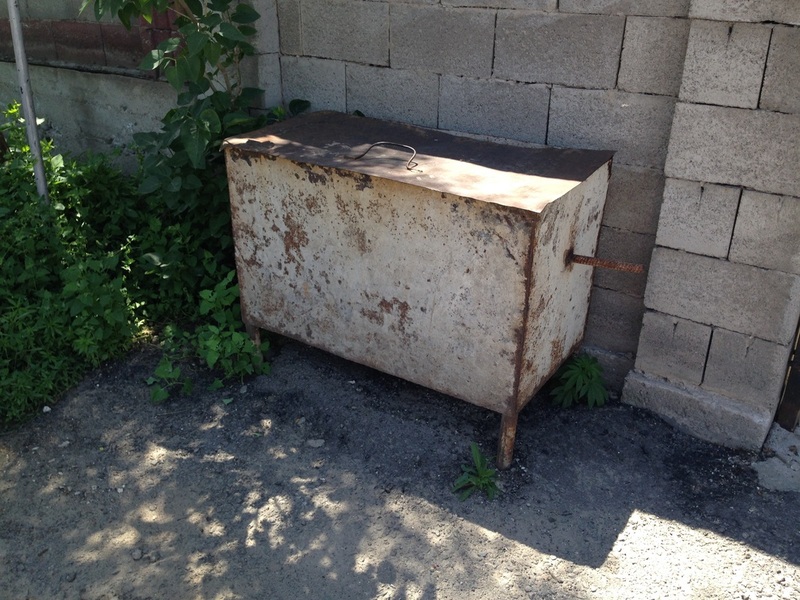 The strange thing is that I've seen these retro "Trash Boxes" only rarely outside of that single neighborhood. Were the citizens there just exceptionally responsible and well-connected? 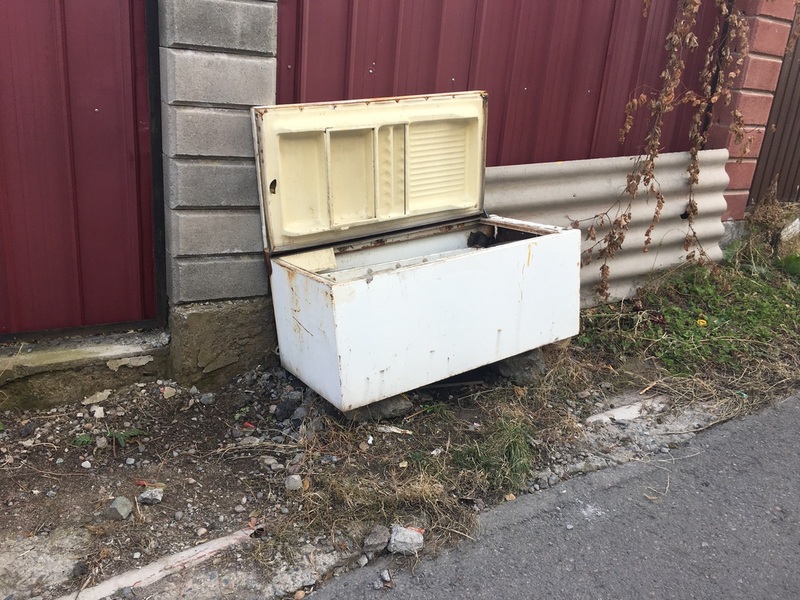 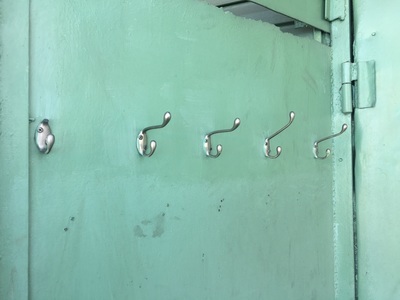 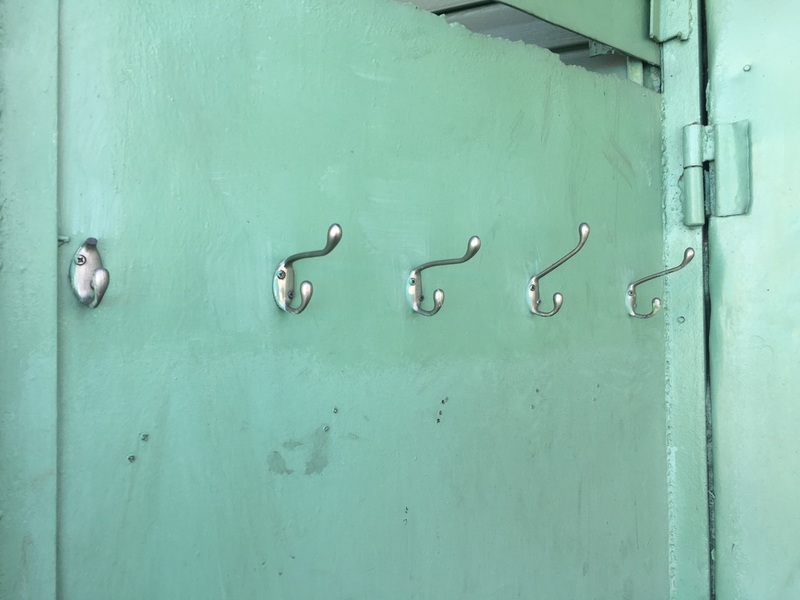 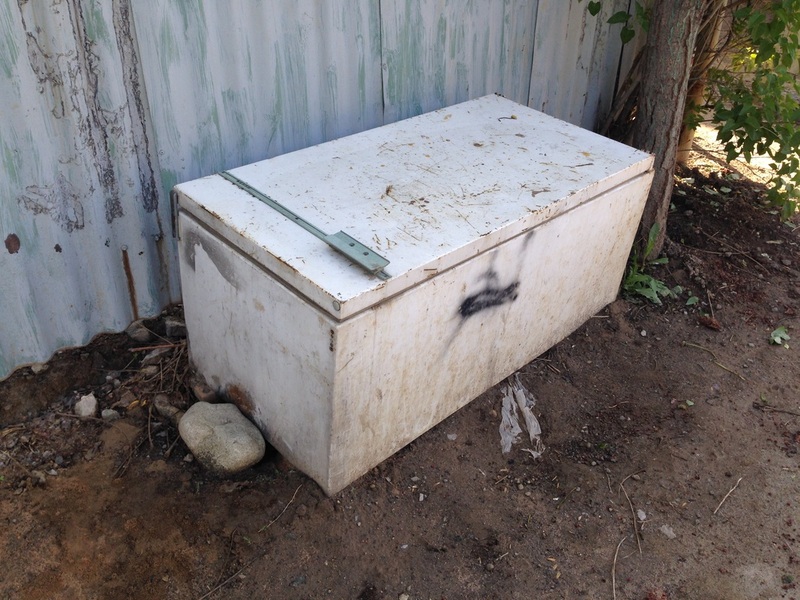 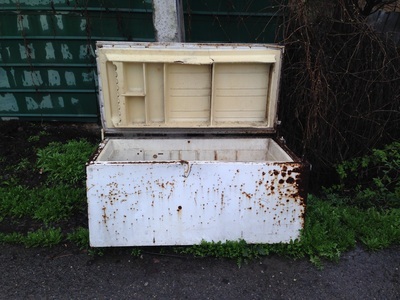 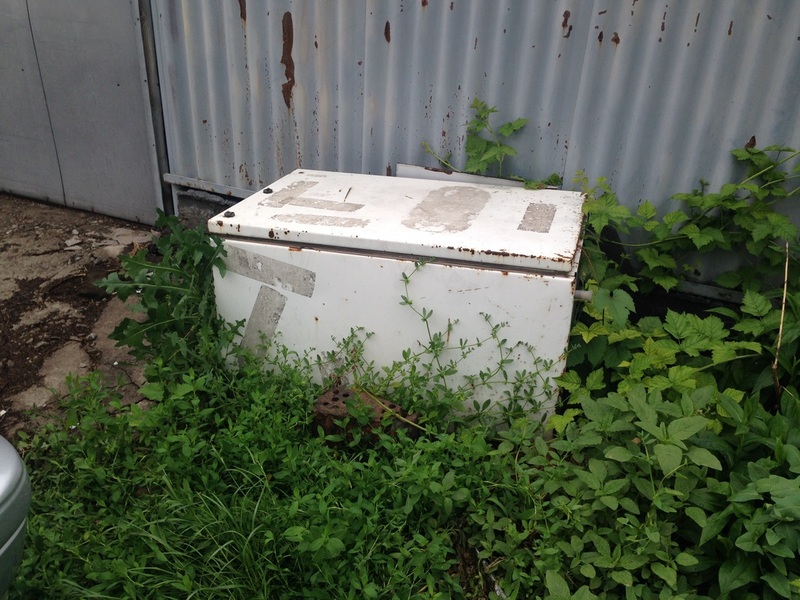 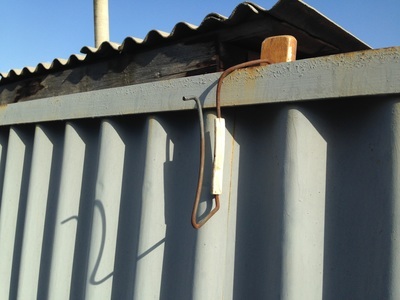 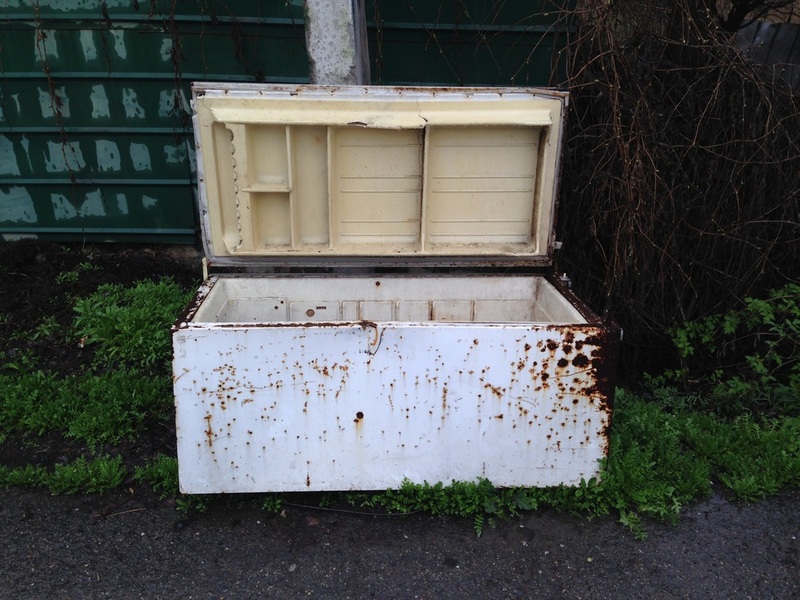 Elsewhere, people have been forced to improvise a solution, and the most common improvisation is the recycled refigerator. 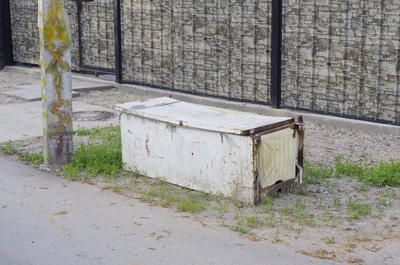 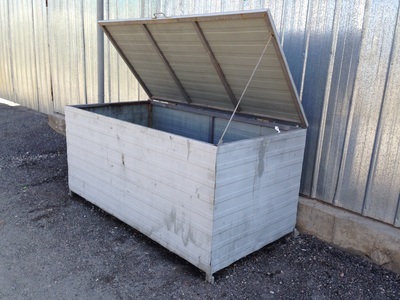 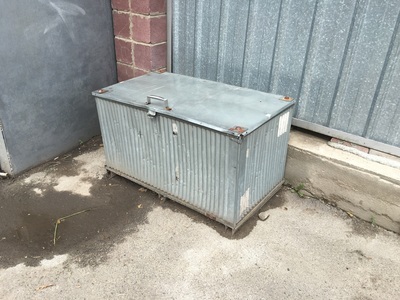 Flip one of these things so that it lies lengthwise and it effectively becomes a large chest, its door, now a lid, already designed to stay sealed. 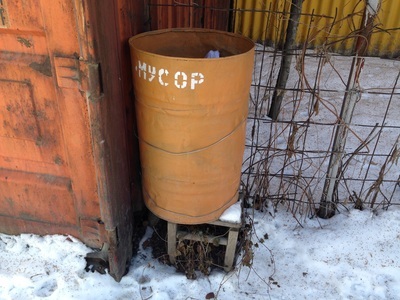 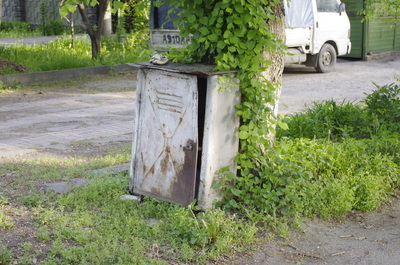 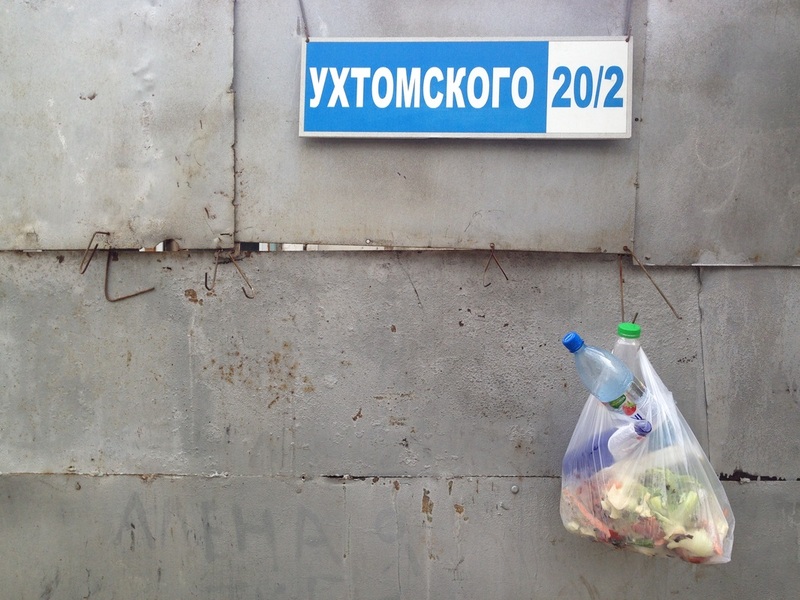 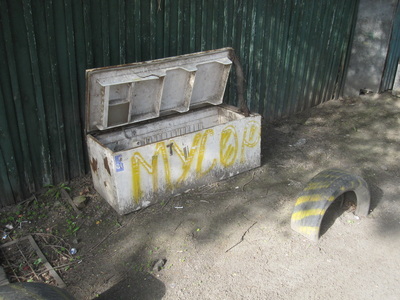 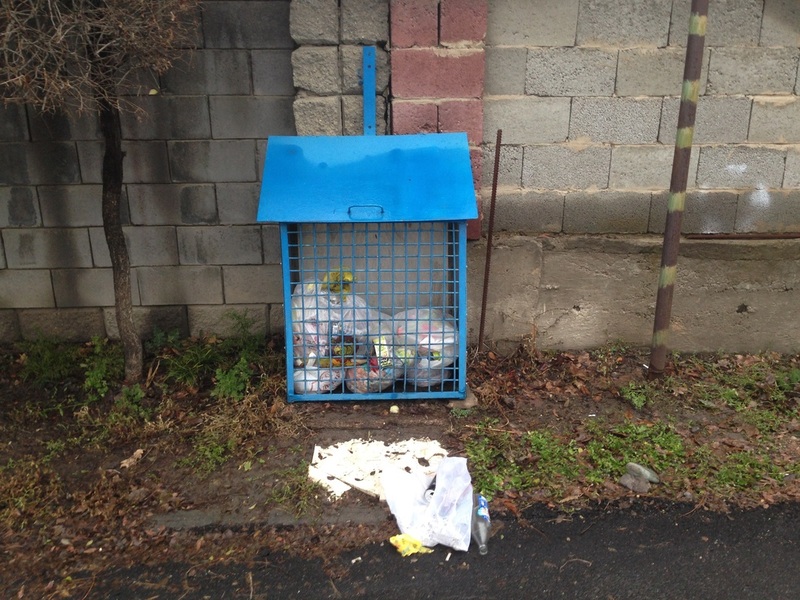 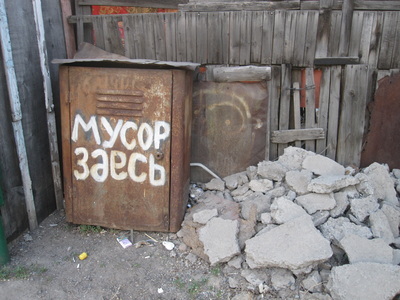 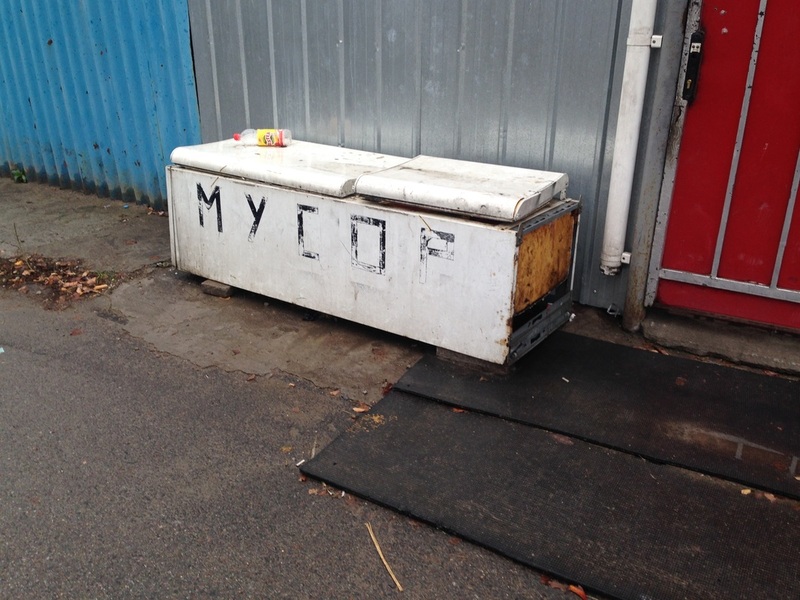 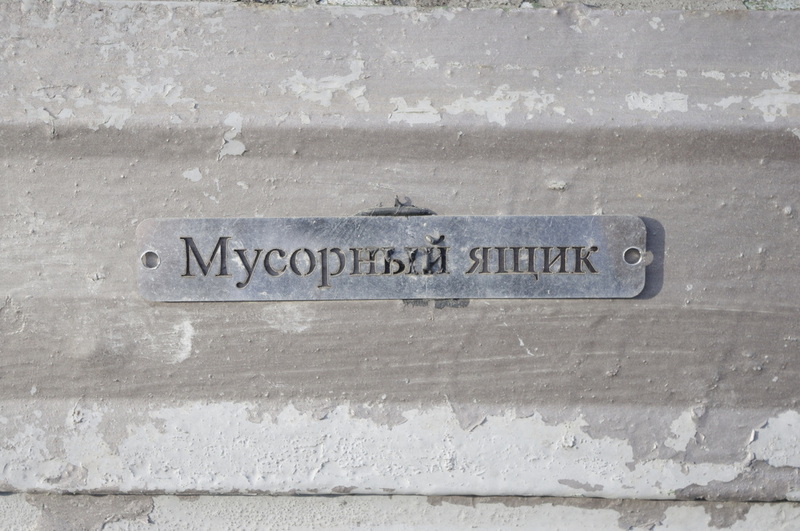 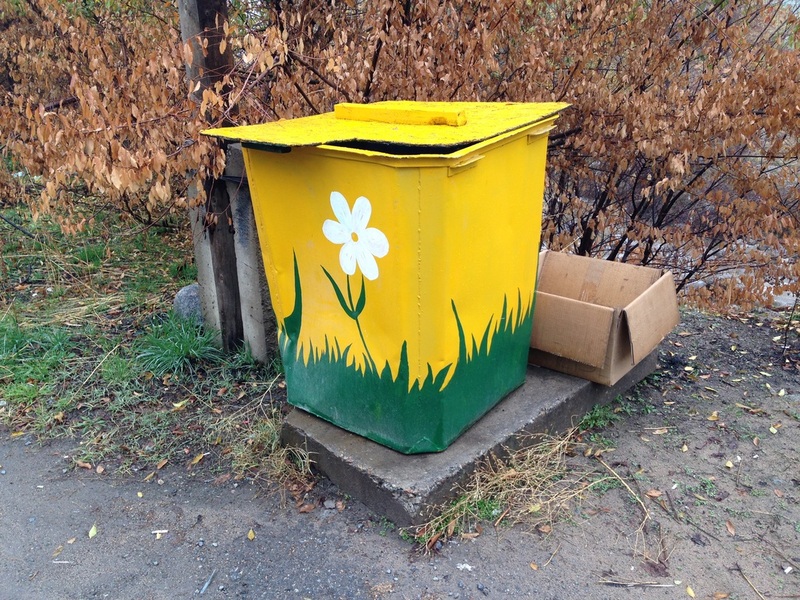 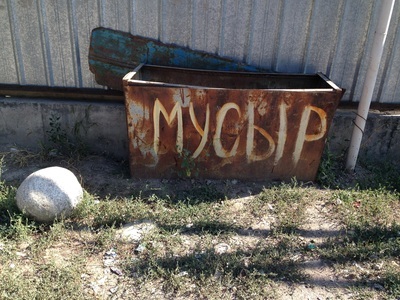 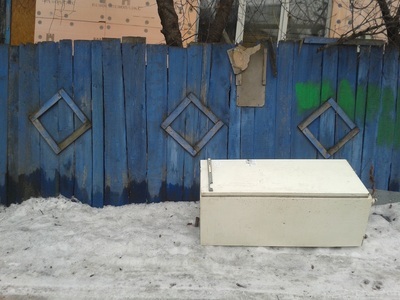 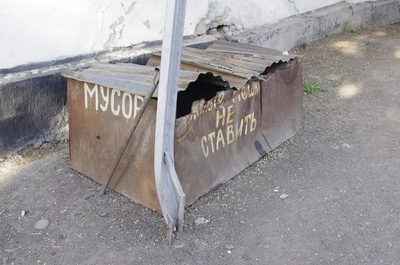 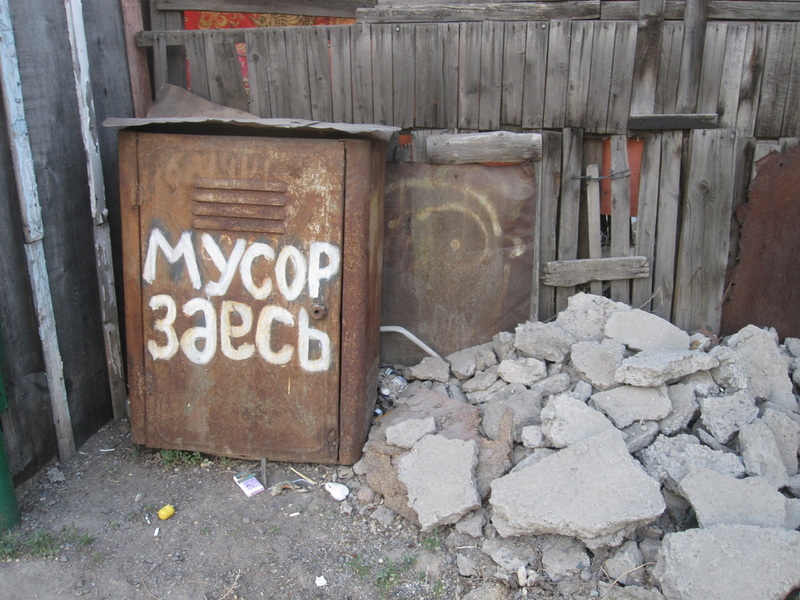 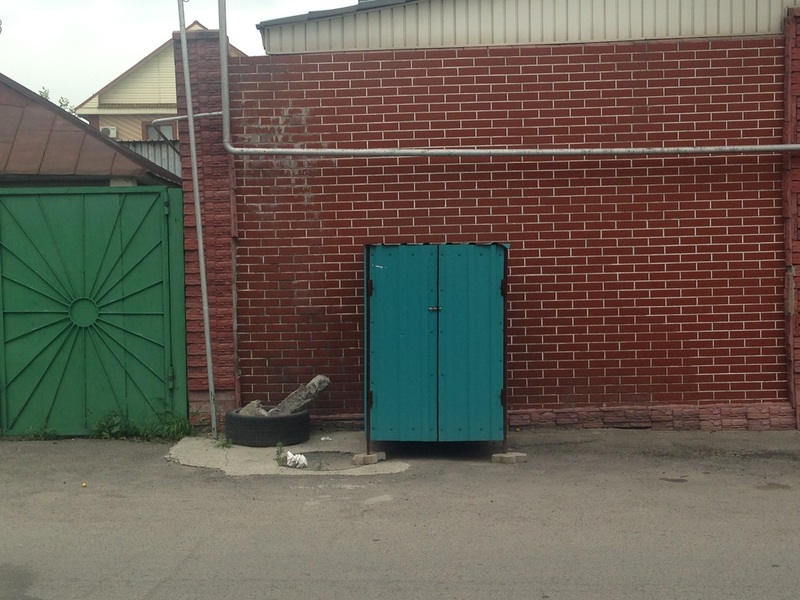 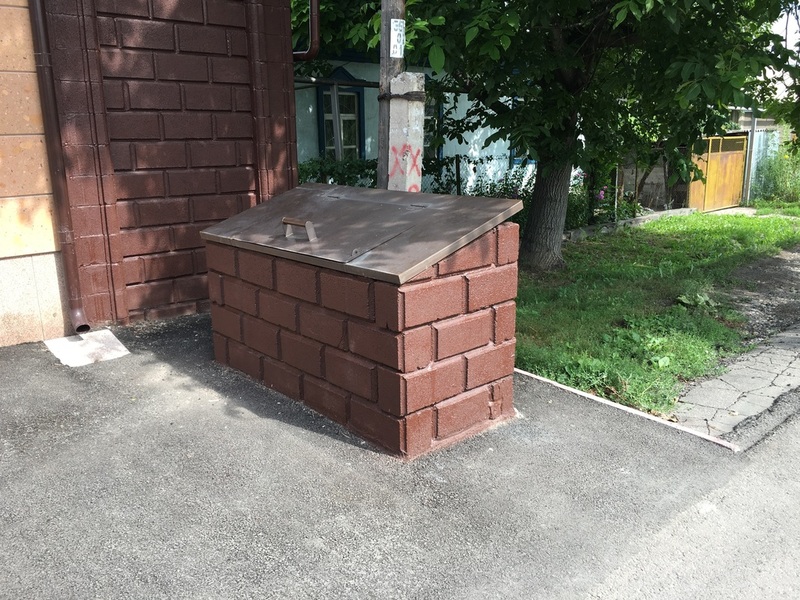 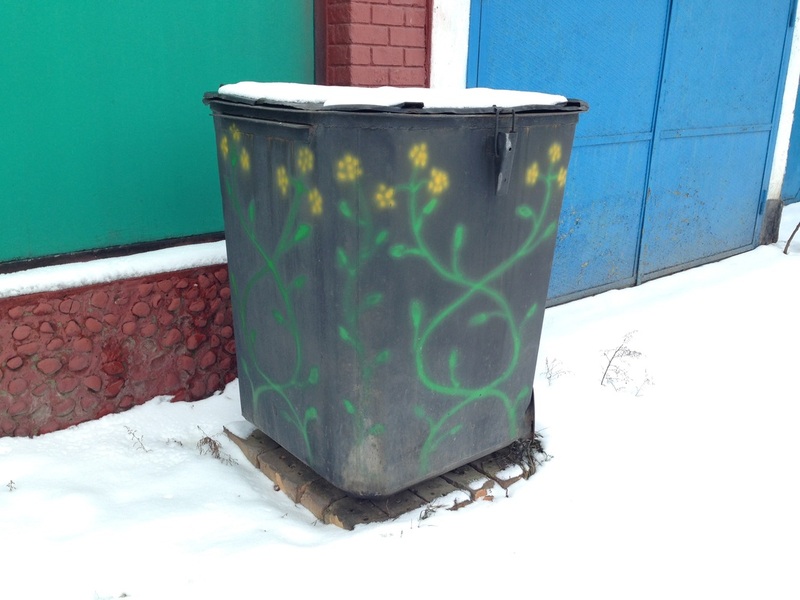 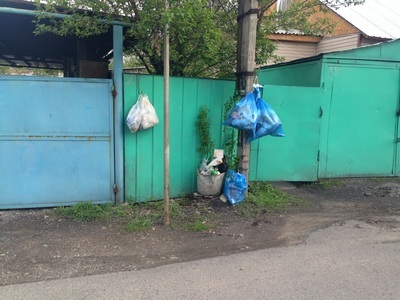 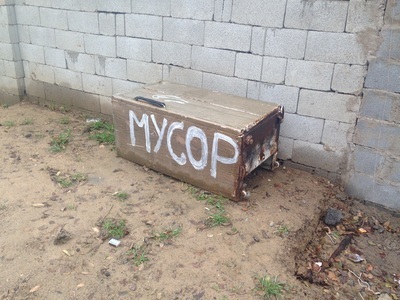 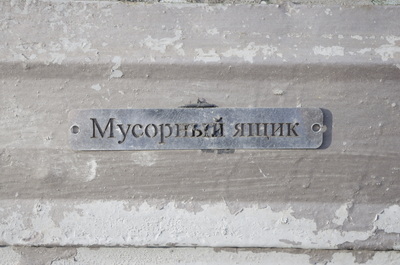 People paint the word "Trash" [Мусор; Musor] on the outside, perhaps so that neighborhood kids won't be fooled into looking inside for cold refreshments, or so that the mythological trash truck drivers will have an easier time finding their target. 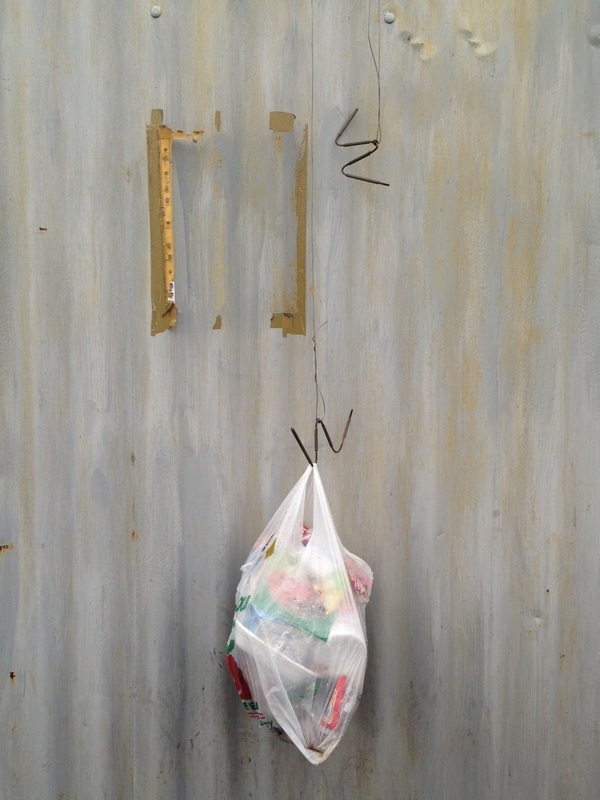 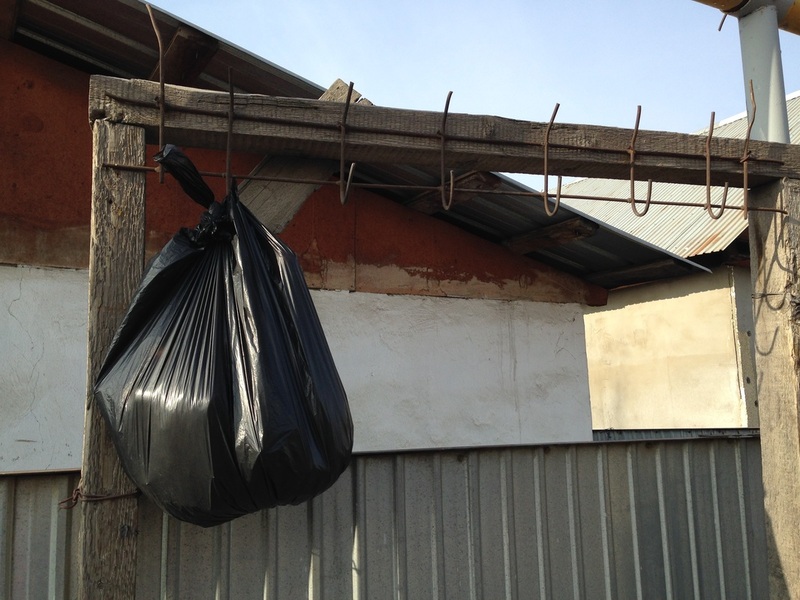 The last solution that I've lovingly documented is the ol' plastic-bag-on-a-hook. 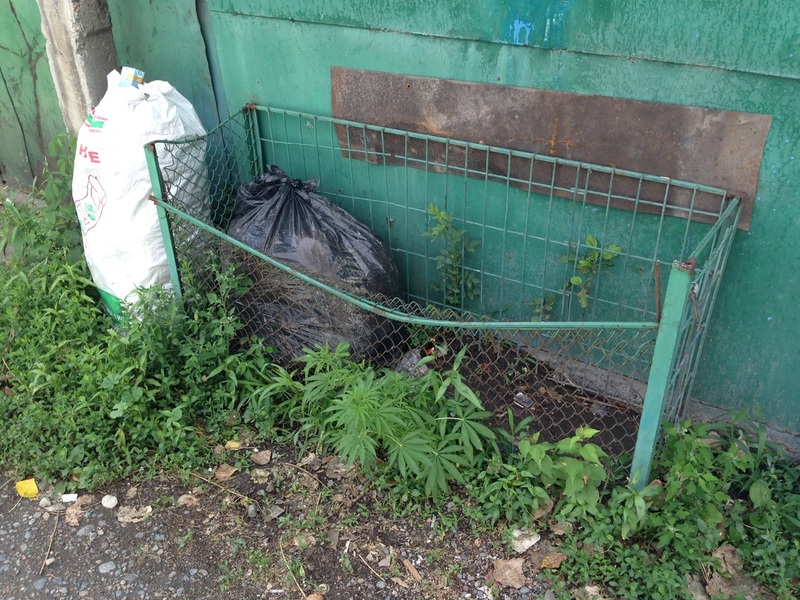 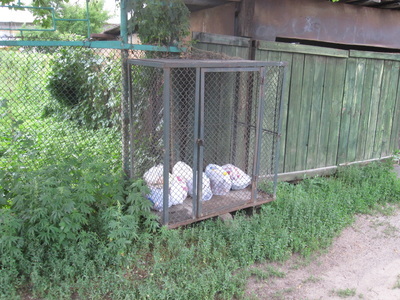 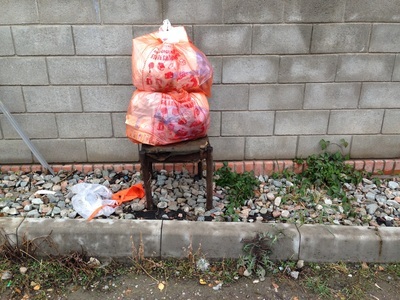 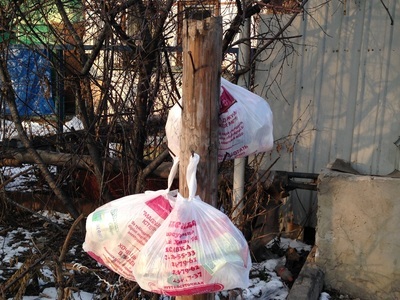 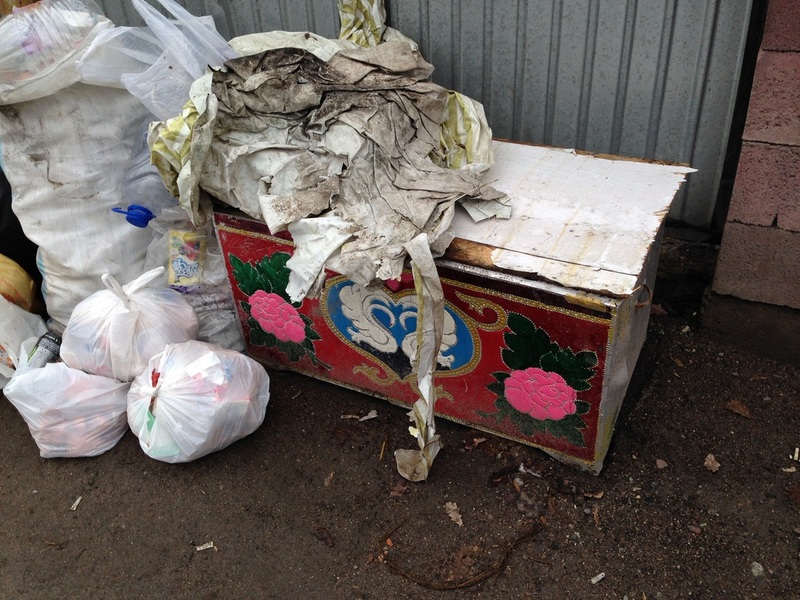 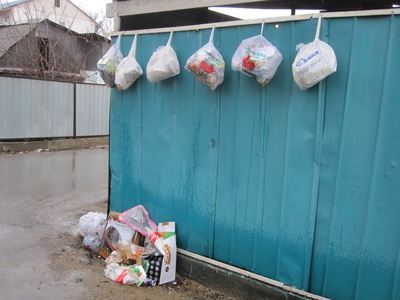 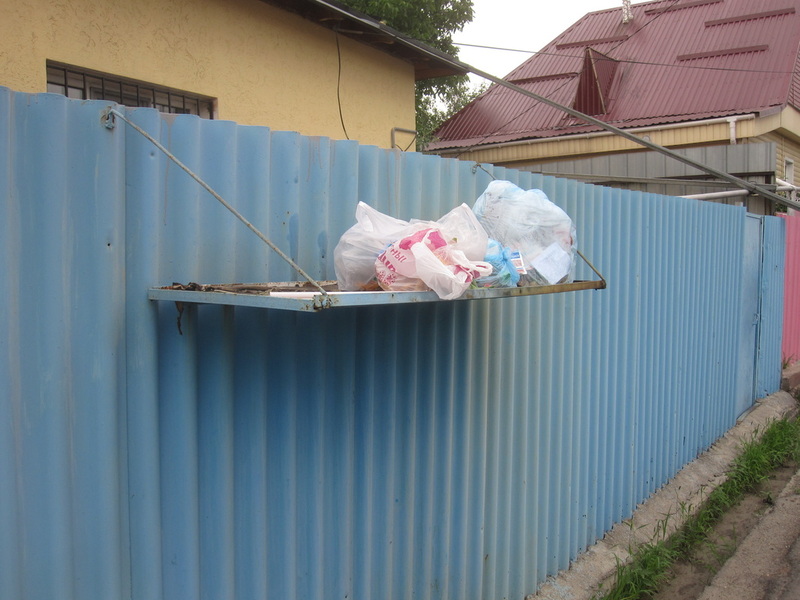 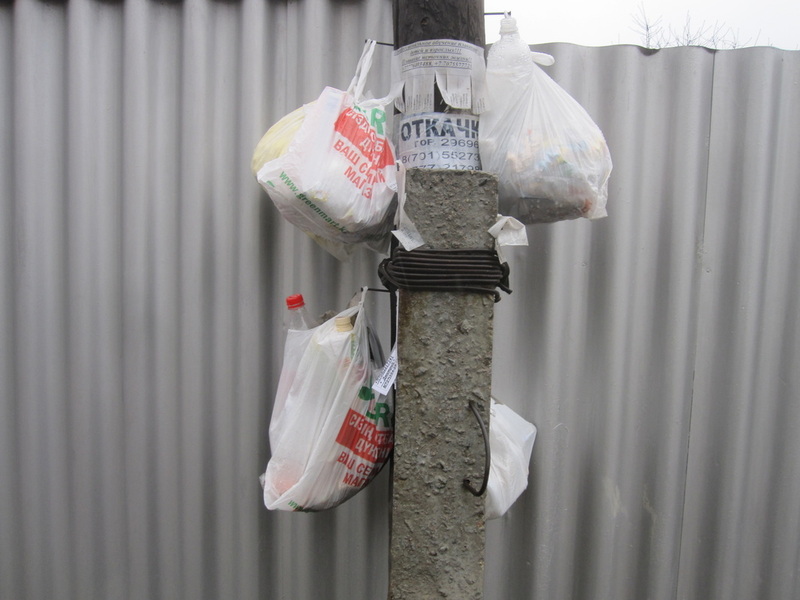 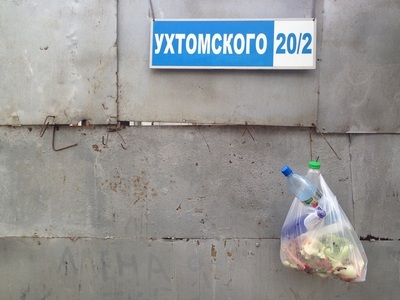 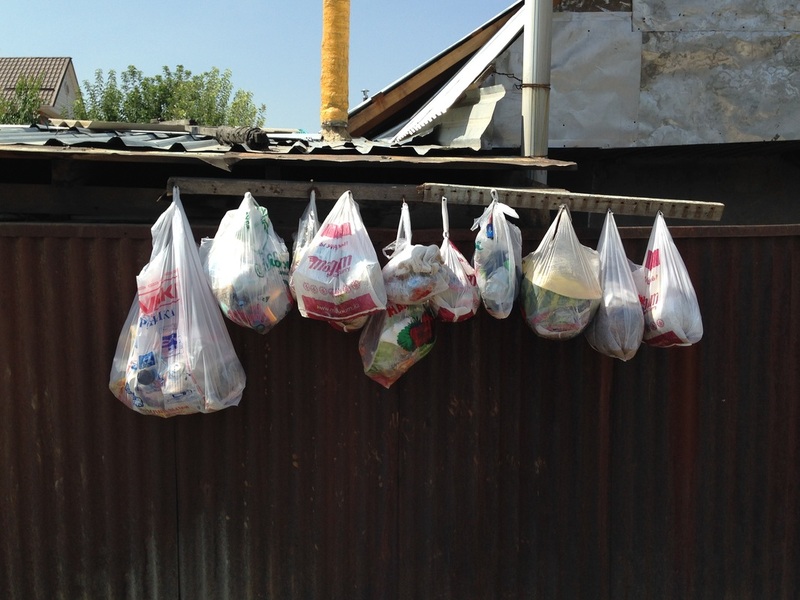 Almaty, it should be admitted, is a city of plastic bag hoarders. 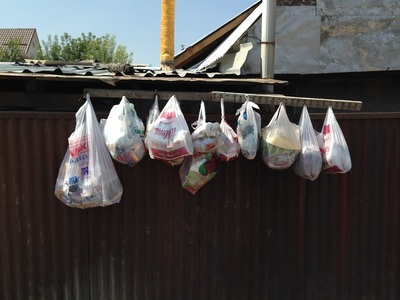 Shops give you a bag for even the smallest of items, and trash bags, designed to line trash cans, are not widely available because, well, neither are trash cans. 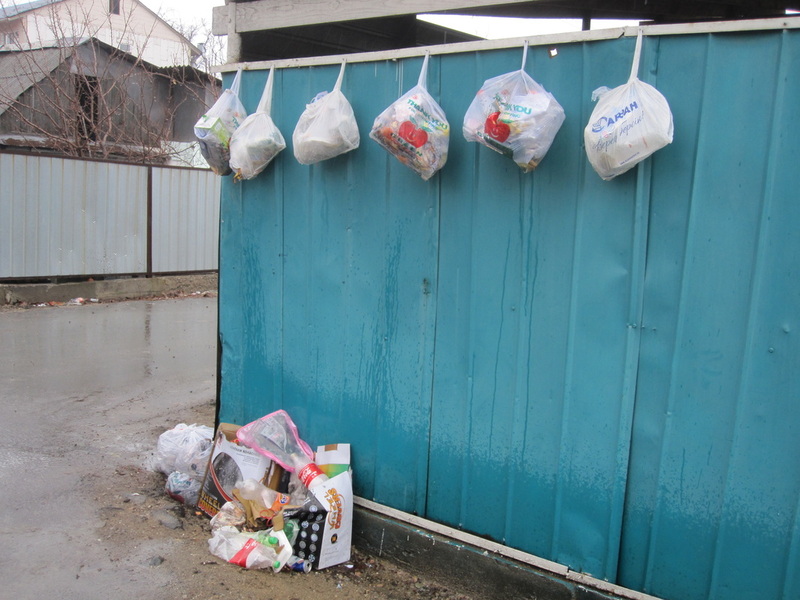 People collect their plastic bags, then, devoting a drawer to them in their kitchen or stuffing them under the kitchen sink, and once they've filled one-too-many with garbage, the stuffed bags get taken out to the street. 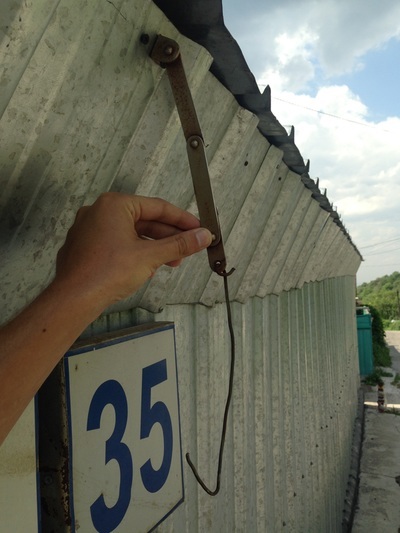 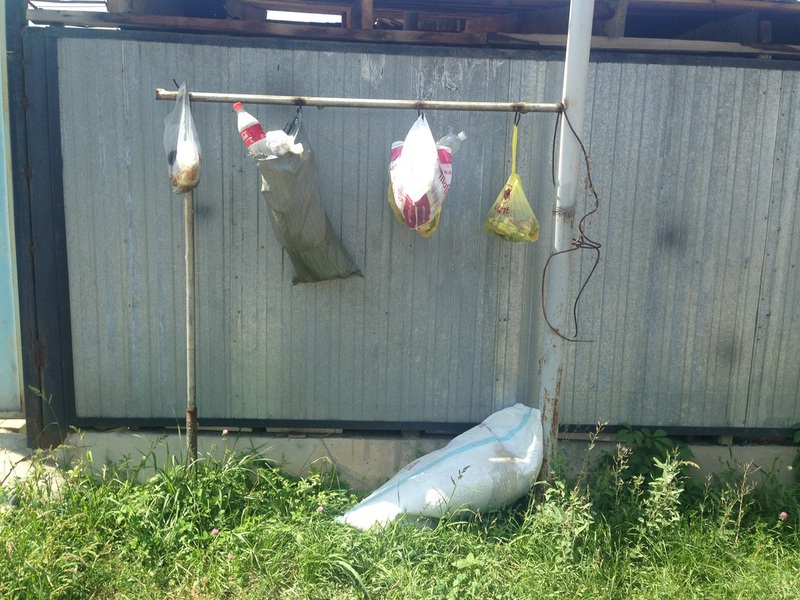 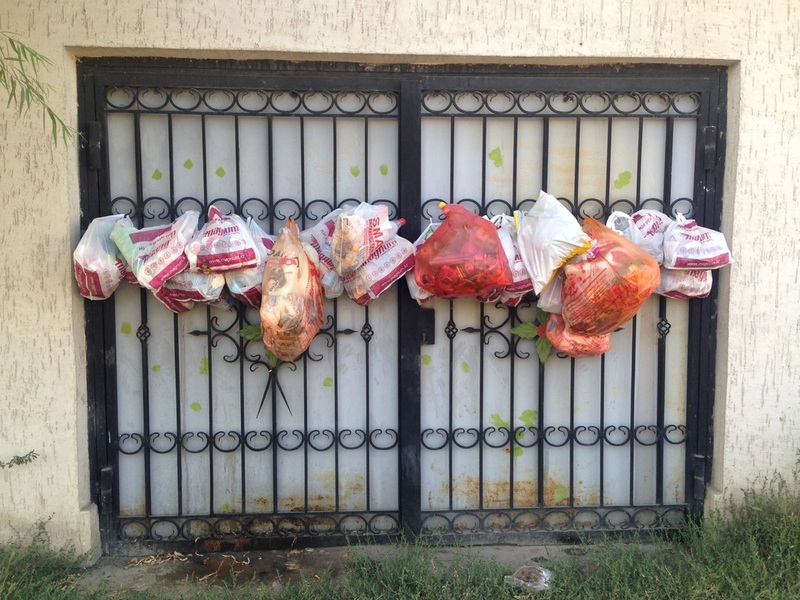 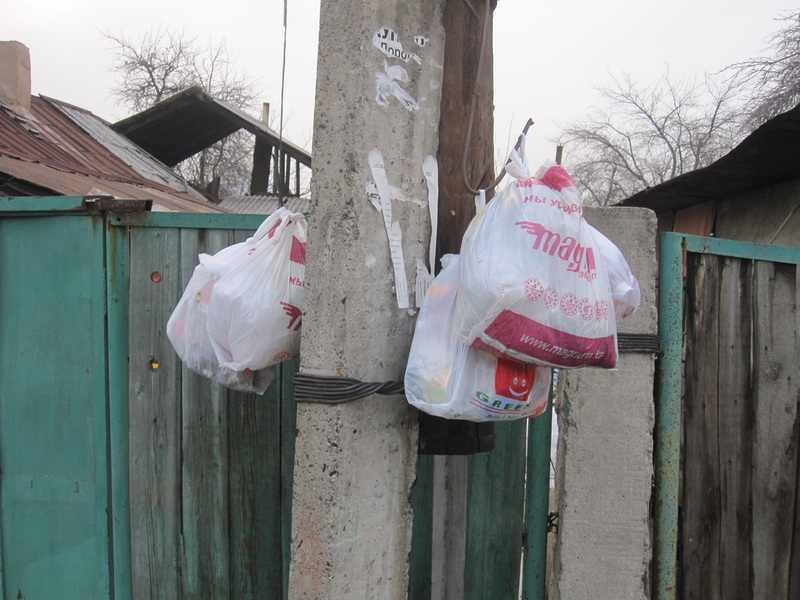 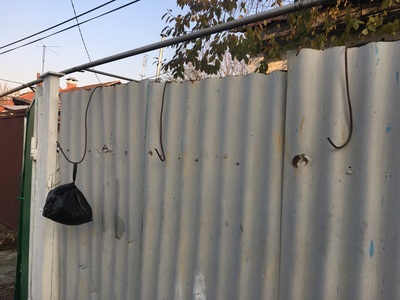 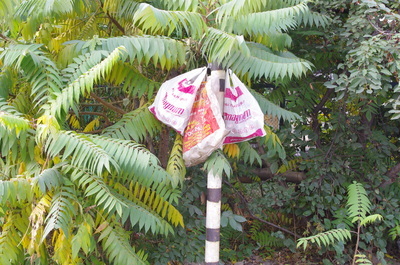 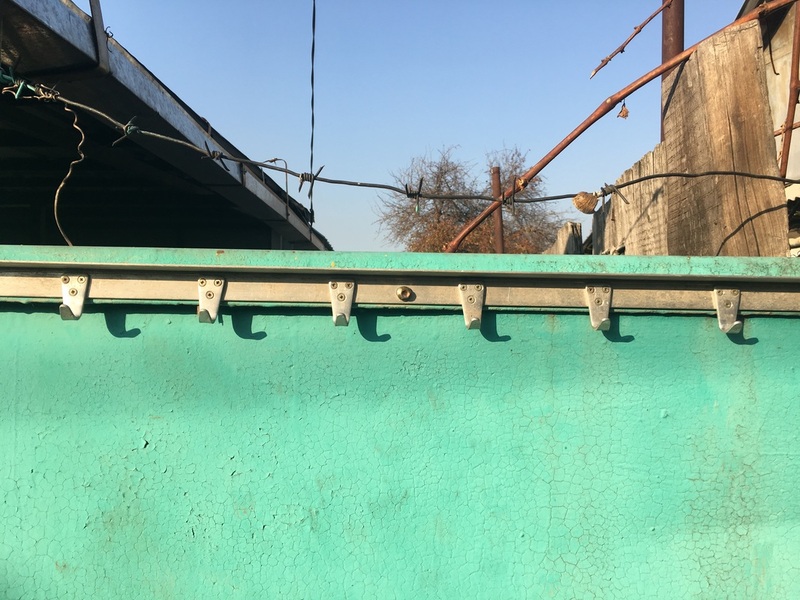 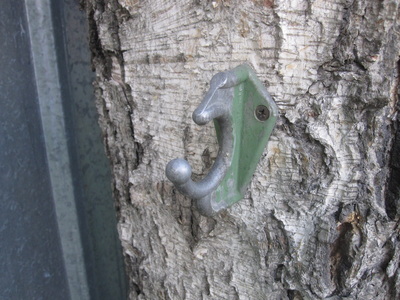 Left on the ground, the bags would be ravaged by strays, so people hang them on hooks they've installed on their fences, or on nearby telephone poles, or even on trees. 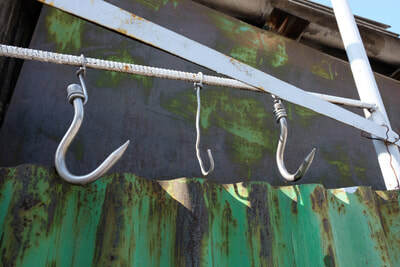 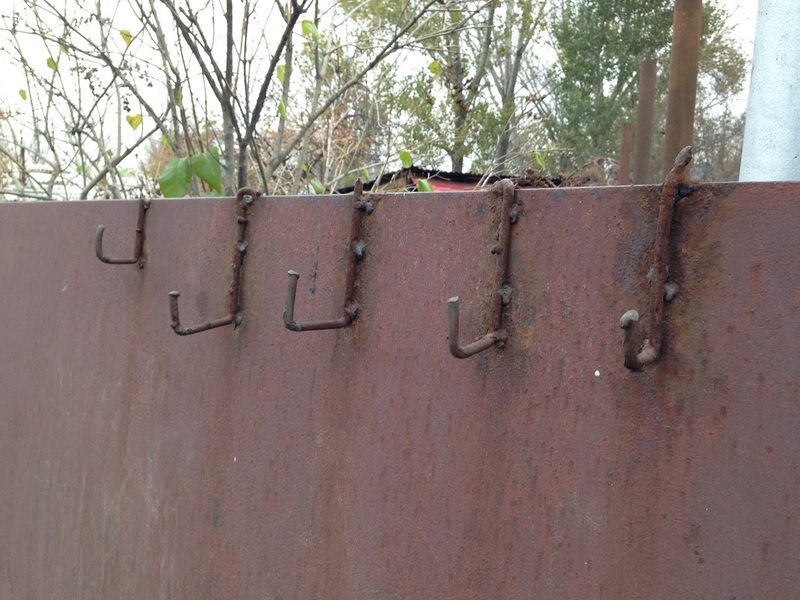 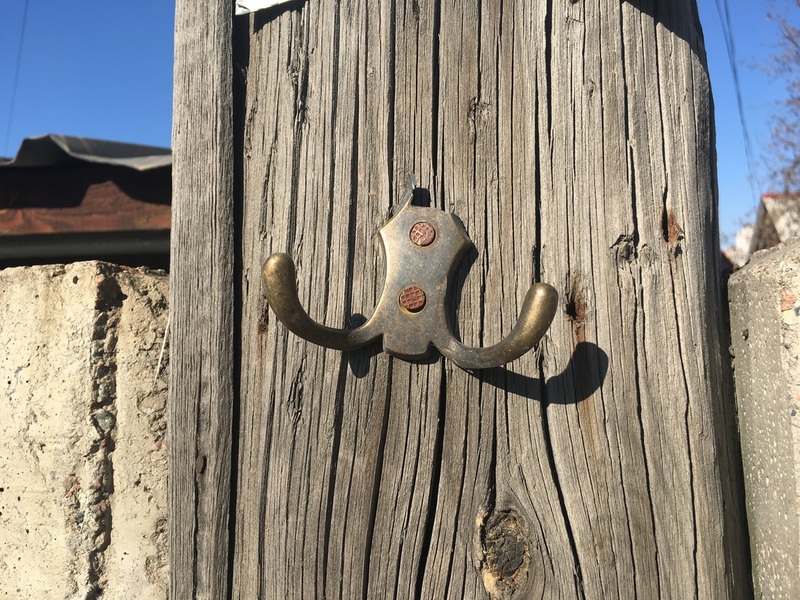 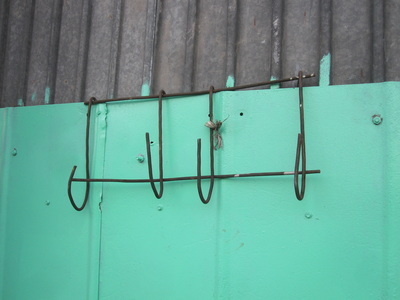 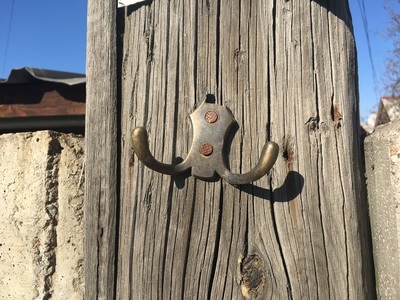 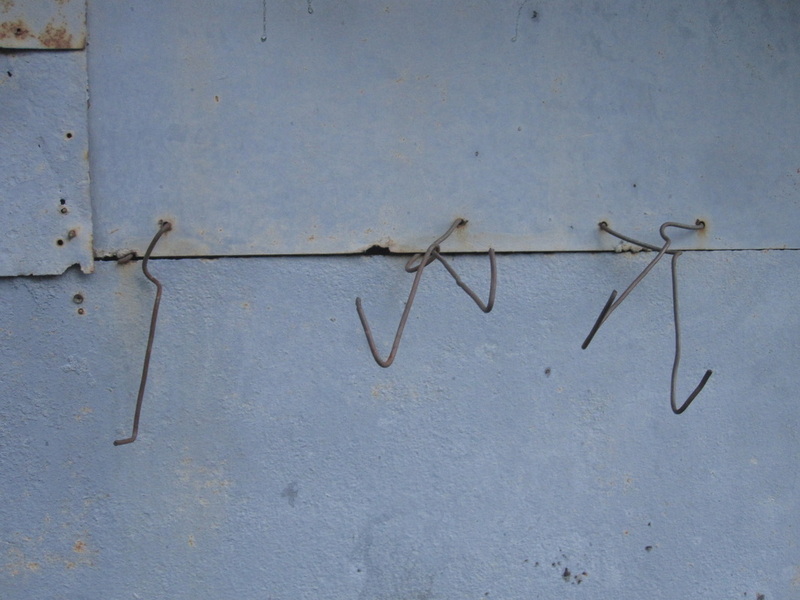 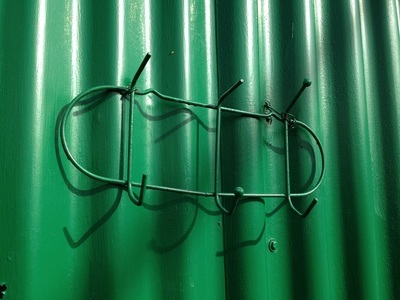 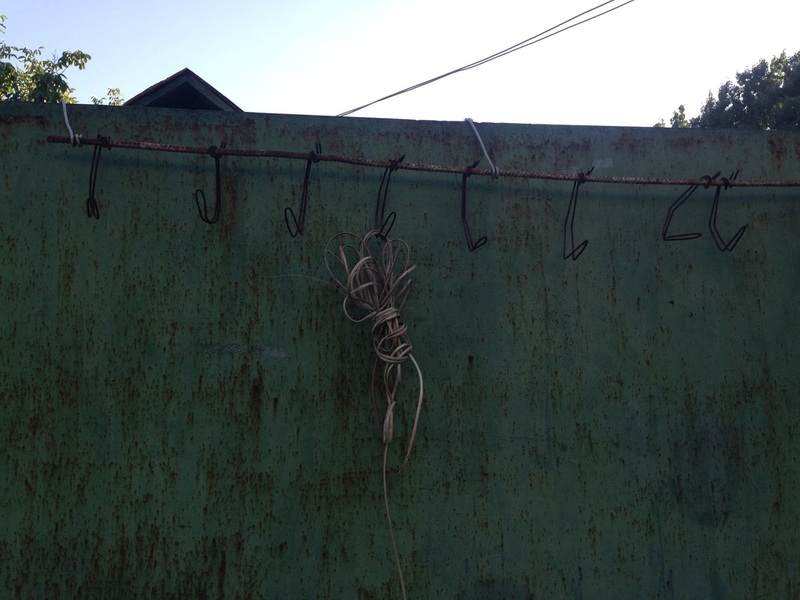 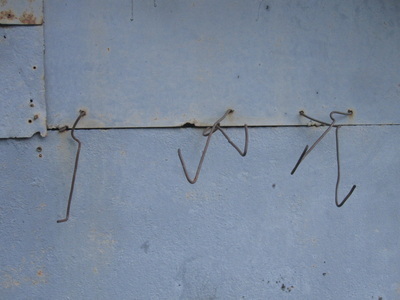 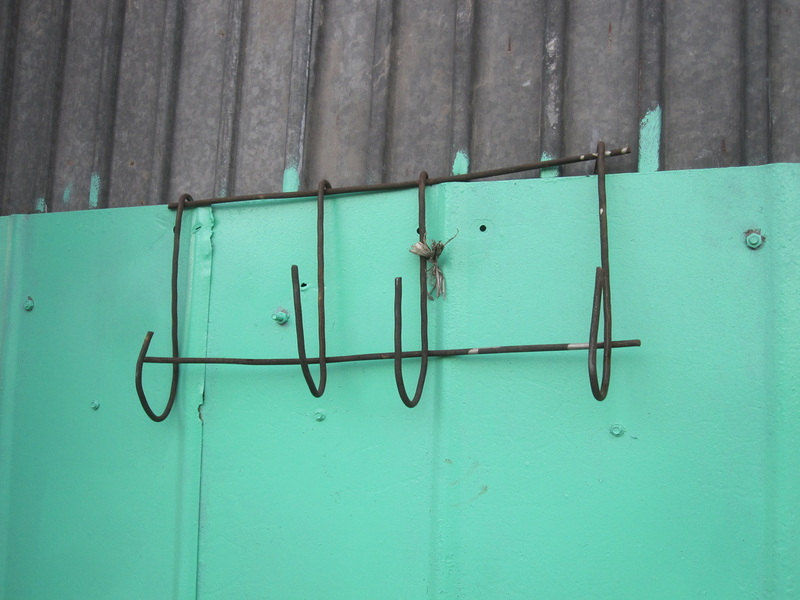 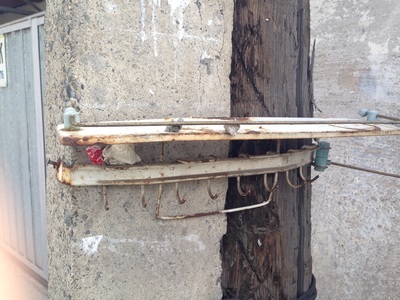 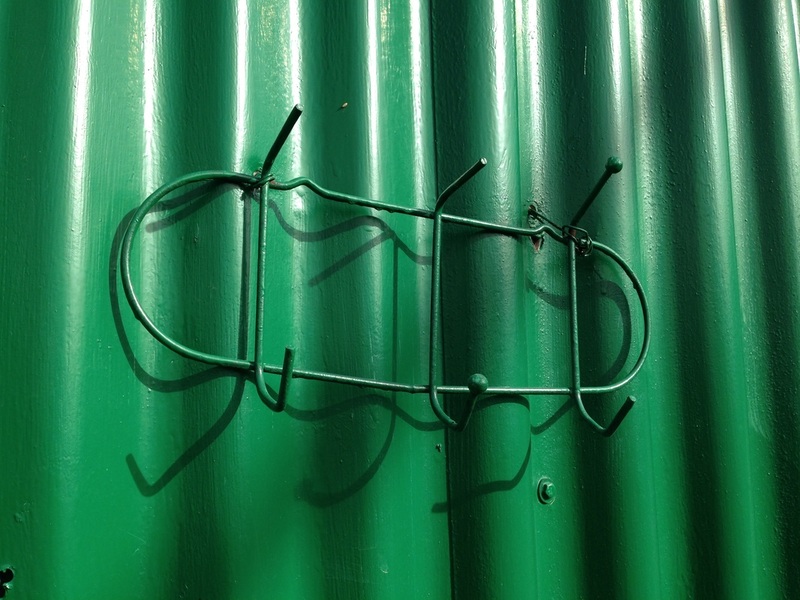 If it's the day after trash day, you may wonder what all the hooks are for, but if you keep your eyes open, walk a lot, and ask questions, you'll find that these artifacts have stories to tell.